This is our third oven. Fourth if we count the temporary countertop model we have used when in between broken ovens. 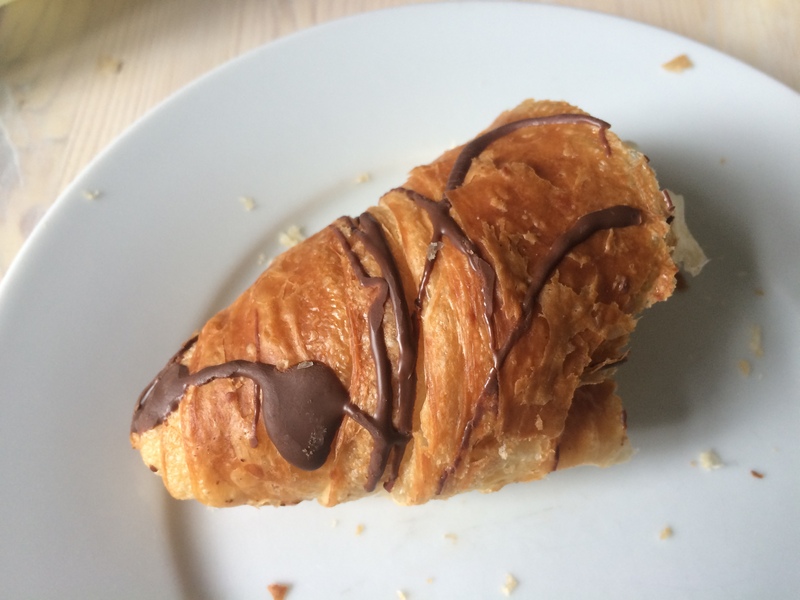 First we used a fun technology with the purchase of an Advantium oven. A combination microwave and halogen heating element baked cookies in 8 minutes. But it overheated and went dead. I bought the part to fix it but broke the control panel taking it apart. I replaced the Advantium with an Ikea model from Craigslist. This one arrived extremely dirty. So I took it apart and cleaned it. That took about a month! When my brother was coming for a visit and I was trying to get the house clean I used the self clean mode. That was the end of that oven! The control panel went dead. Apparently this is a known issue with self cleaning ovens. They overheat and in this case blew a safety fuse. Typically this is due to a malfunction in the exhaust fan or temperature control. In any case it is common. I could have bought the parts and tried to fix it but I also ran the risk of spending more money on it and not getting it fixed. 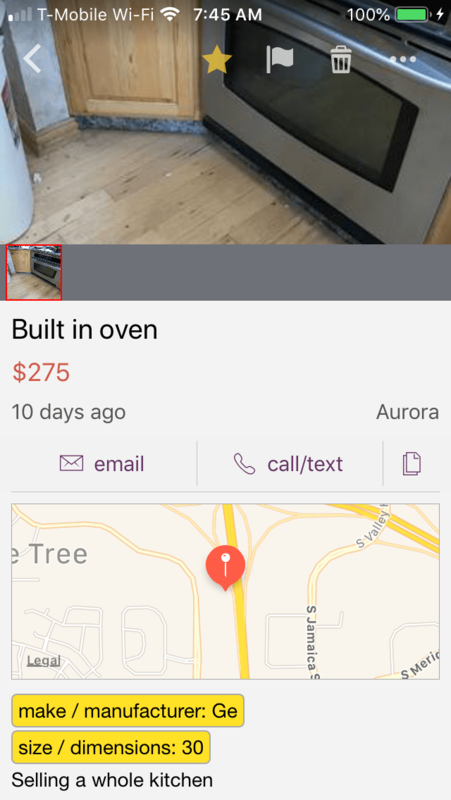 So I started watching Craigslist for an inexpensive used oven. I enquired about several but they were often more expensive than what I was looking for. In the meantime we still had the countertop model I put on the bar table and great food including a few tasty pies were made in it. As Thanksgiving draws near I started thinking I needed a replacement oven large enough for a turkey. So I looked up craiglist offers and found several whose owners forgot to take their ads down after a sale. I wasn’t thrilled about the drive but I decided to purchase a stainless steel GE oven of unknown age and exact model. It is a GE Profile series and the owner was willing to negotiate. It was a 45 minute drive in the truck to reach the guy remodeling a home in Aurora. The owner also had an older Advantium for sale but I wanted s turkey oven. He told me he had bought the home in 2001. So I’m guessing the oven is about that vintage. 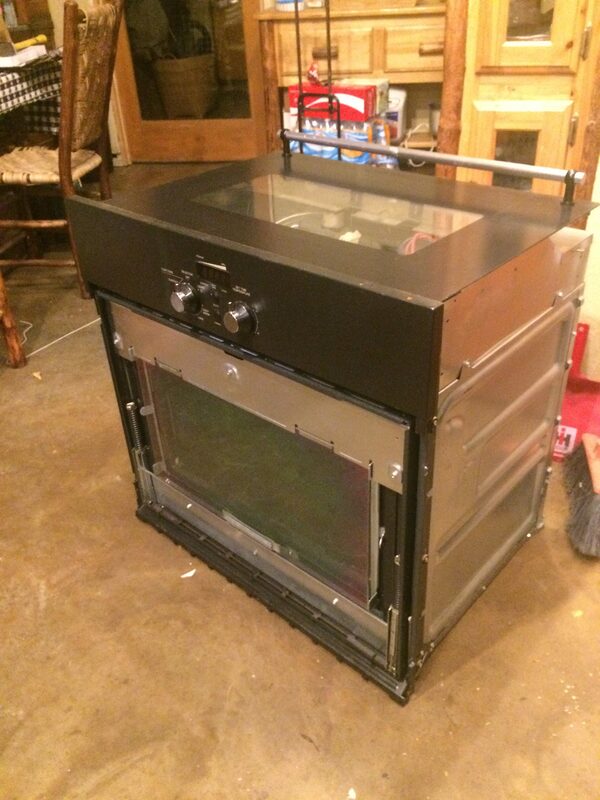 This oven was much cleaner than the Ikea and it only took a day to take it apart and clean it. The shelves are not shiny but a gray porcelain so it appears they can be left in the oven when it is self cleaned. The owner told me he self cleaned it before removing it for sale. The oven is a bit smaller than the Ikea. A little less wide inside as it is probably better insulated. I has “true convection” and instead of just a fan to blow warm area around the interior like the Ikea, it has an element surrounding the fan. 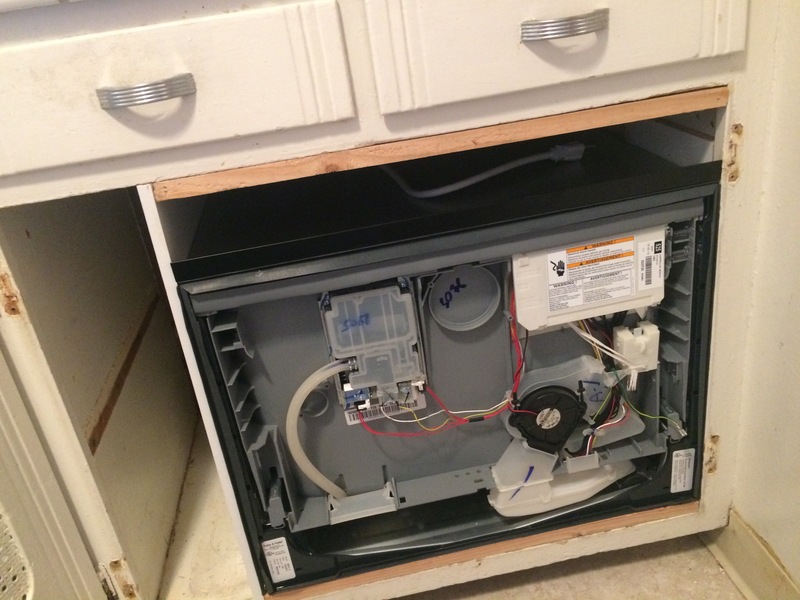 The bottom heating element is also protected by a porcelain false bottom that can be taken out and cleaned. It was a puzzle to get the Ikea oven out of the cabinet because the latch was stuck shut. All the online info said to move the latch with a coat hanger to open it but I couldn’t find the latch. Finally I pulled the door out just enough to take off the front panel of the oven. Then the latch was accessible and I could open and remove the door to unscrew the oven from the cabinet. I used the island table with cardboard protecting it to slide the oven onto. Then with a helper it was easy to lift it down to the floor for disposal. The opening in the log cabinet was exactly the right size for the new oven. 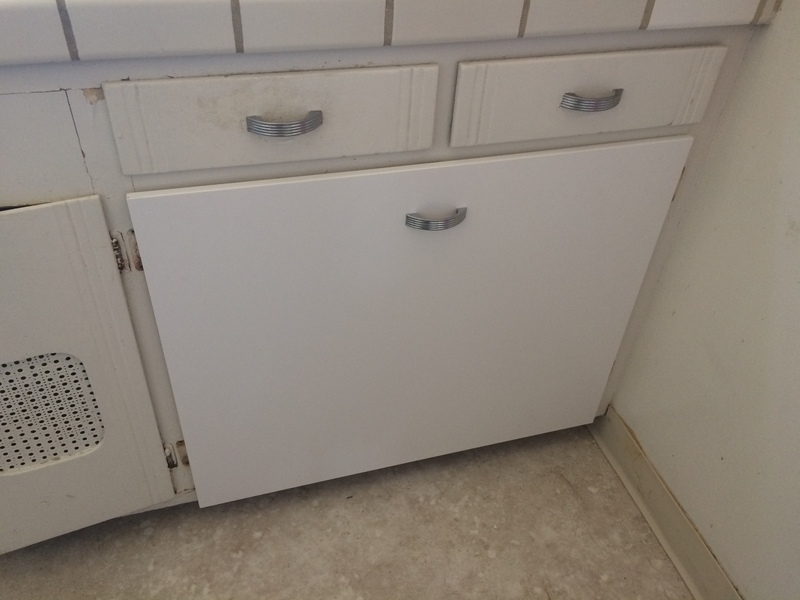 It even slid in a bit further and was easier to screw into the sides of the cabinet. 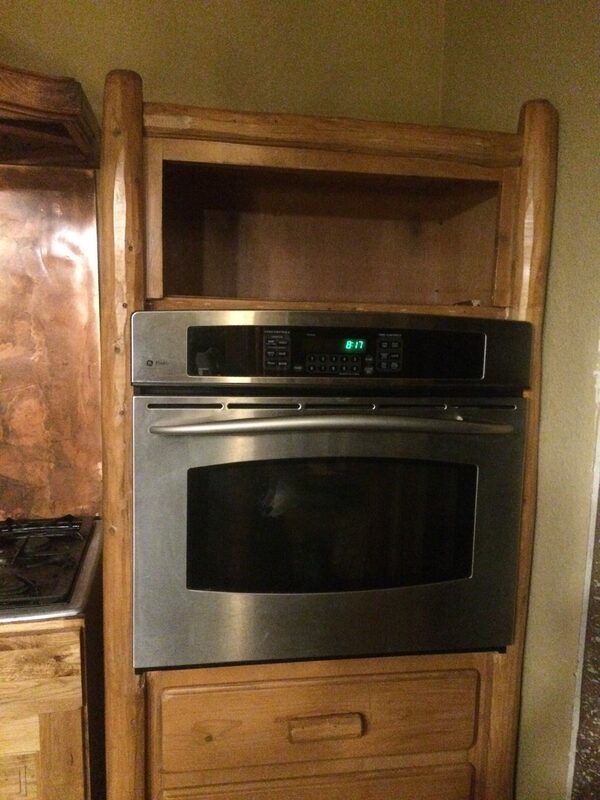 I forgot to put in the shelf above it so I had to unscrew and pull out the oven to fit the shelf back in from behind the cabinet.The shelf actually sits a bit lower with this oven than on the other so there seems to be room for a short microwave above it, about 10″. It will be nice to clear off more countertop if I can fit a microwave up there. Ours is quite old and dented and even a bit burned inside but it works. Although it is small it doesn’t fit above the oven. Even though the oven is an older model, it has many electronic functions that seem to work fine. Dave roasted a chicken in it with convection roast and it was very successful. The fan that cools down the oven is not very loud although it seems to run much longer than the Ikea did. It makes sense that a better insulated cavity would take longer to cool. It didn’t come with a meat probe as it should have so I ordered one and I’m looking forward to roasting with a probe that will measure for doneness; a convenient gadget for the Thanksgiving turkey! It works! I’m so pleased with the wood boiler system. This fall it was easy to start up. Just a few steps and it was all working as designed. I recorded the steps I took to get the first fire for the season started. Before firing up the stove it’s a good idea to check and empty any ashes from the ash drawer. I also cleaned the glass front of the stove. 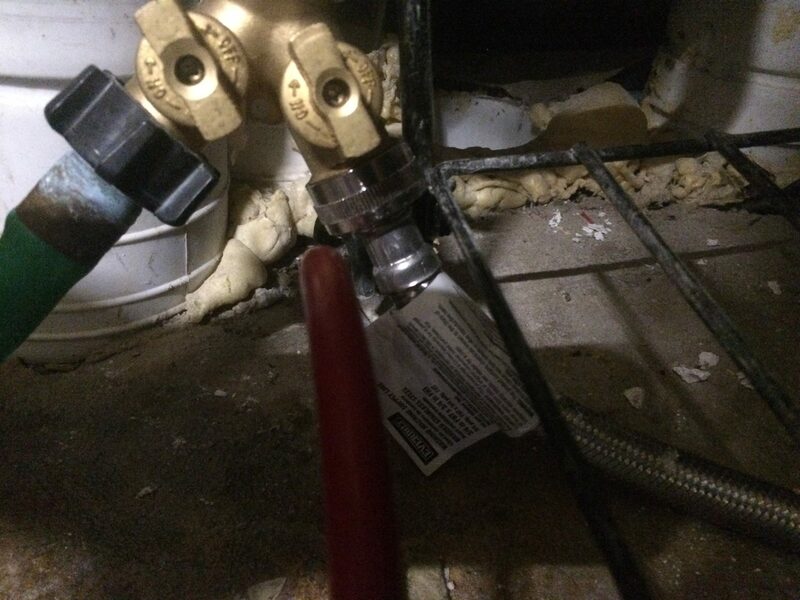 Then I uncapped the boiler drain and hooked up a short hose to the spigot. Running water through the system with the end of the hose in a bucket will release air that may have entered the pipes. To get the water moving in the system the stove pump switch is turned on. I also checked that the automatic fill valve was open. There were very few air bubbles. 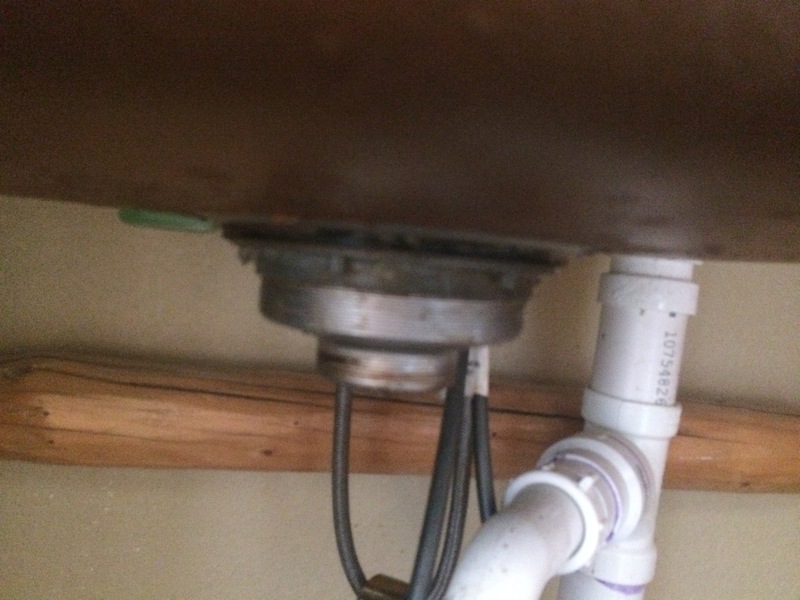 Once the water stops bubbling in the bucket, the drain is closed and recapped. After that initial step, each fire of the season is the same. 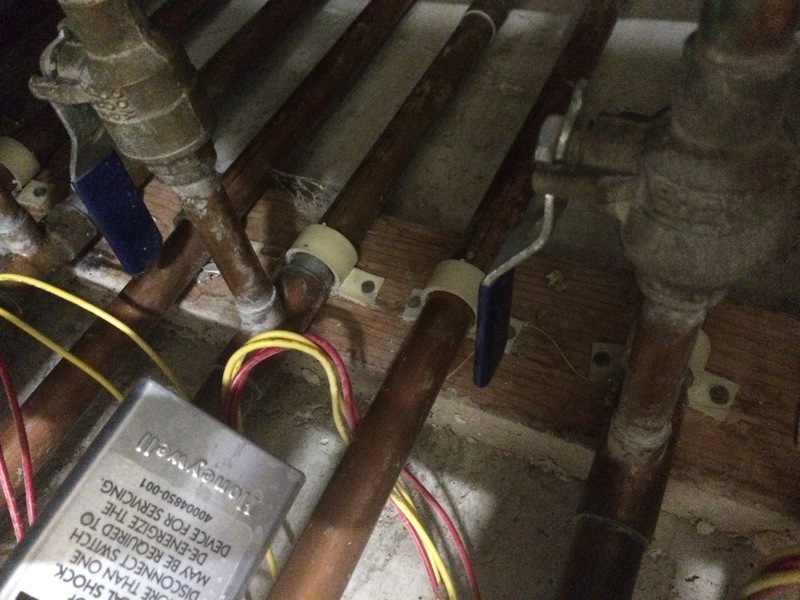 Turn on boiler pumps with switch in laundry room. Be sure the primary pump is running. Check that all valves that control the flow to the boiler and heating system are open. Plug heating system pump into the power strip. This separates it from the thermostat controller so it runs all the time. Open all stove air intake valves. There are three. One in the ash drawer, one on the bottom right controls the outside air flow, and one on top controls the chimney damper. Open a couple of zone valves. There is not enough heat to open them all and just a couple will warm the house. Once fire is going close the ash drawer intake. Then manage the outside air and damper with the other intakes. 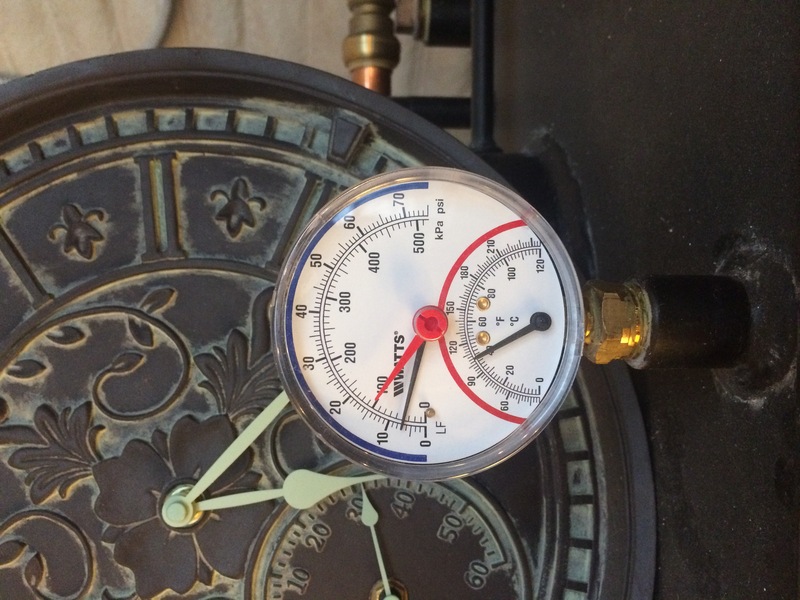 The water temperature and internal pressure can be monitored with the gauge at the top of the stove. The red marker is set at approximately atmospheric pressure. 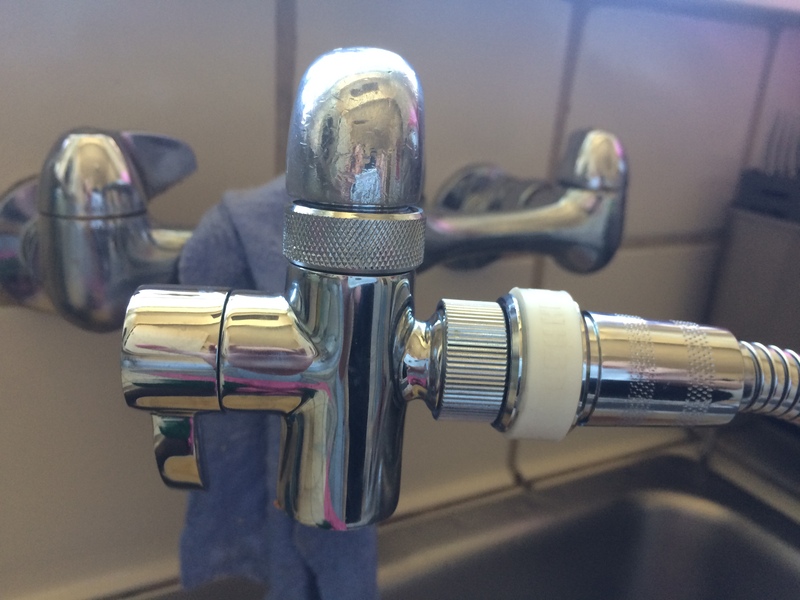 If the water gets too hot the pressure release valve will open and relieve the pressure and send overheated water into a stainless steel milk can. When the water gets to 90 degrees the second pump turns on. That sends the water to the heat exchanger. I check to be sure the secondary pump is running at this point. If not, the fire would need to be separated and stop burning so the stove would not overheat. In the exchanger the warm water from the stove runs next to the water from the radiant system. The heat transfers from the stove to the system water which is pumping through the open zones. 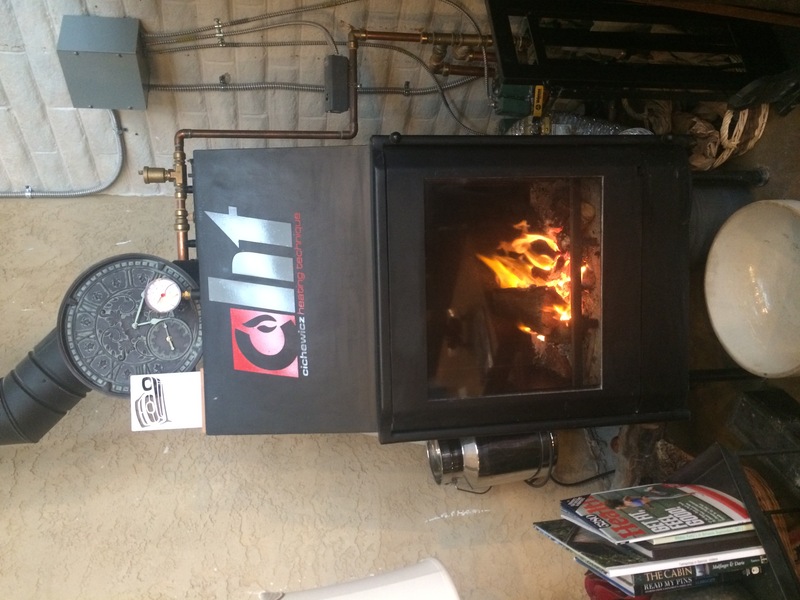 Transferring the heat from the stove to water means that the stove does not get hot like a normal wood stove. Having a fire in the evening is quite lovely on a snowy day. 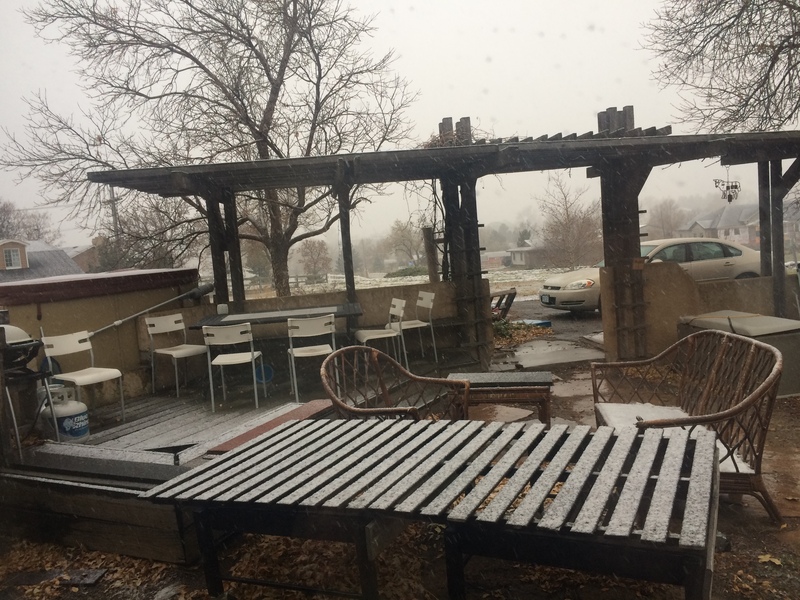 This is the first snow we’ve been home for. It snowed while we were out of town but it melted before we got home. And inside the fire is so delightful. 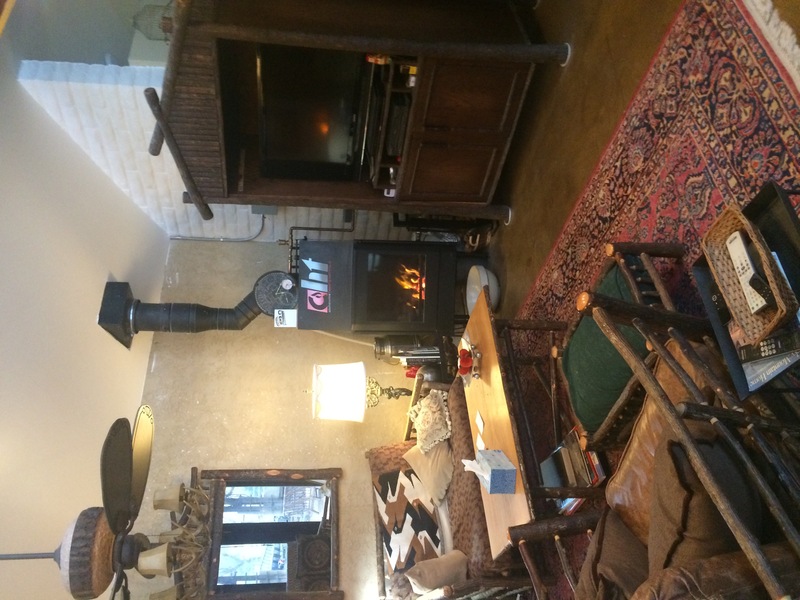 When the fire dies down and it’s time to turn the heat back on, the system pump is plugged back into the thermostat controlled outlet and the switch to the wood boiler pumps is turned off. The house is cozy and the heat is unlikely to come back on before morning. I was fortunate to pick up a couple of free 50 lb bags of Mapei Novoplan 2 self leveling cement compound for free. 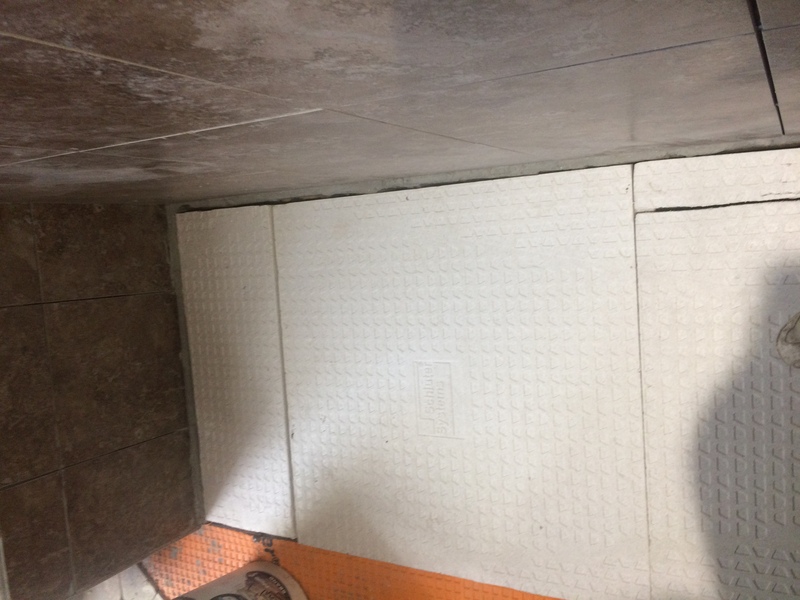 I needed it to level the shower floor. 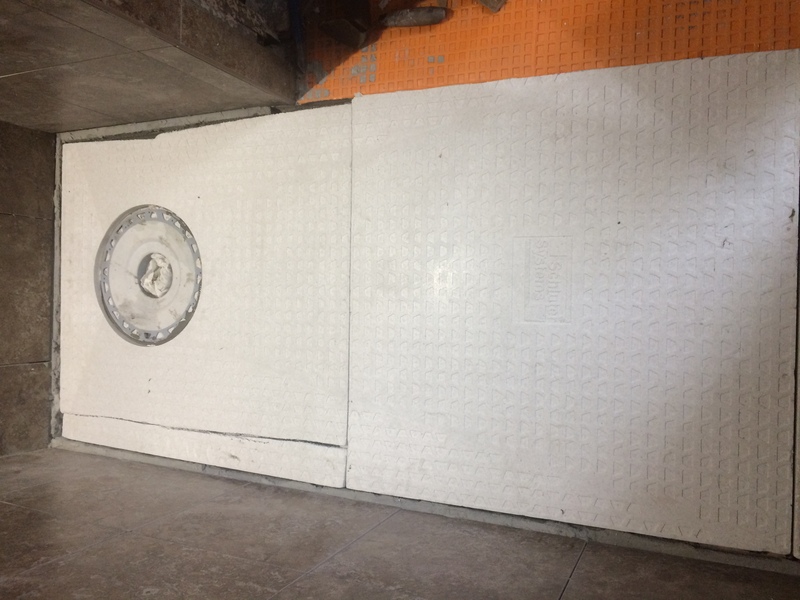 Although some filling had been done with mortar, specifically a big hole in the corner near the wall, the Schluter Kerdi shower base installation requires a completely level floor. I read the instructions on the Mapei website and then looked around the internet for installation advice and for my small area most of it didn’t pertain. Except I did decide to apply the Mapei primer. So I had to make a trip to buy that. For porous cement as in this shower which had never been sealed, the instructions recommended thinning the liquid 1:1 with water. So I did and spread it with a paint roller as recommended. Some of the primer remained a bit white as it foamed a little when I mixed it with water. I tried to thin out the white areas but then I just left them and one coat seemed to dry very well giving a slightly shiny cast to the cement. The white spots went away after the primer dried overnight. The next day I mixed the leveling cement. I had a partial bag to use up first. It was about 3/4 full so I used about a gallon of water instead of 5 quarts. 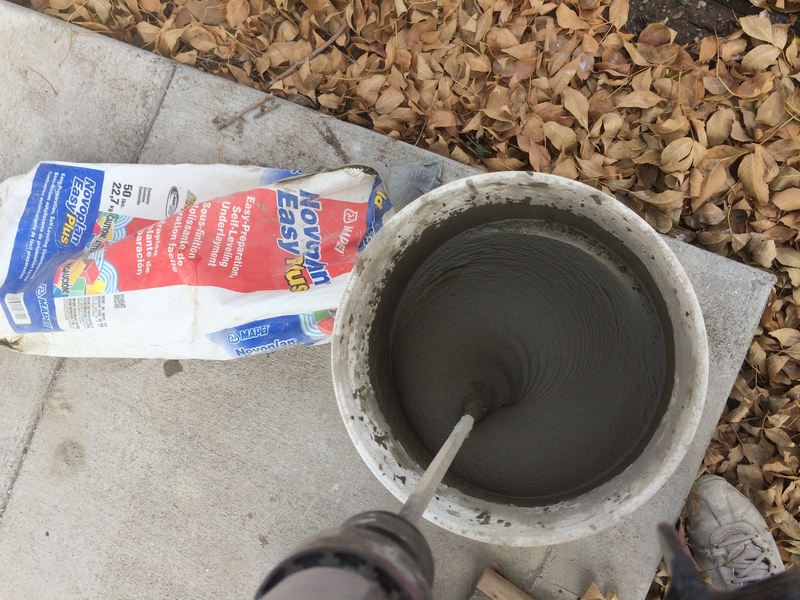 It was easy to mix, pouring half of the bag into the pail of water and mixing with my good 1/2″ drill and cement paddle and then pouring the second half in and continuing to mix. The final product is quite soupy and I knew the consistency was right from watching videos of others pouring. 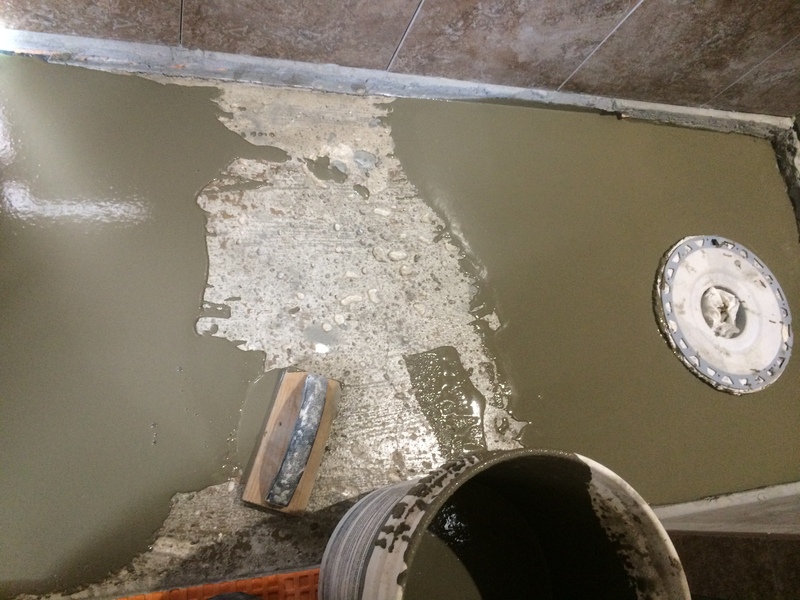 The advice was to mix the cement where you would be using it and I found out why when I carried that five gallon bucket into the bathroom from outside. Boy that was heavy. The pour was pretty easy. I used a wooden float to smooth it out and push it together. The internet also said to keep the edges wet and mix and pour quickly. With such a small area that was no problem. 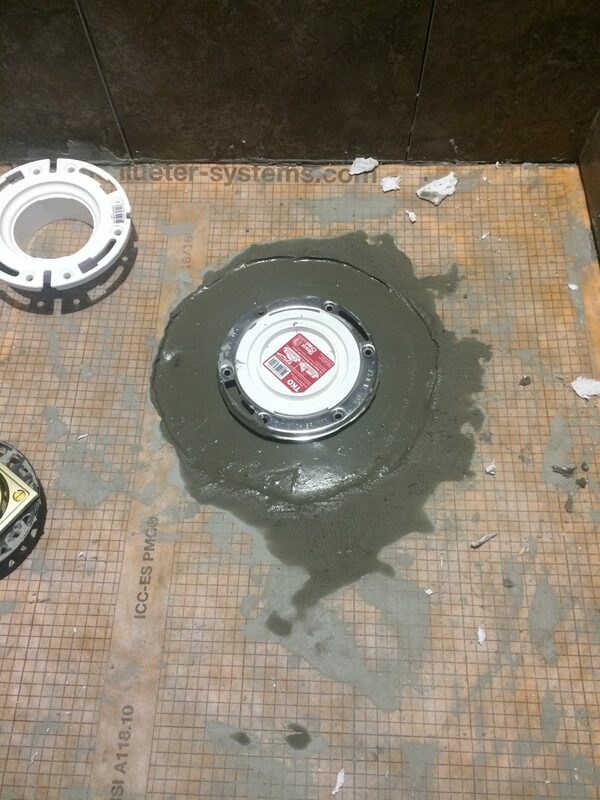 After pouring around the drain and getting it to flow evenly there, I poured the other end and worked it into the corners, then the pour met in the center. Unfortunately I only needed a little more than half of what I mixed. So a lot was wasted. I didn’t have another use for it so I just mixed water into it and dumped it on the outside gravel patio that we will eventually cover. The setup time was only 15 minutes and the slurry was workable most of that time. I tried smoothing a spot with a metal trowel but the cement just stuck to it and left a divot. In that one spot when I went back over with the wooden trowel I could tell it was starting to set so I just left it alone. The small divot the metal trowel made magically came back together through its self leveling power. I didn’t try to alter the depth of the slurry, I just poured a bit and spread it around. I really wanted to maintain as deep a depression in the floor as possible so that the styrofoam Kerdi would meet the edge of the cut out in the cement. When pouring the floor I used some old panel doors from my daughter’s house to create the cut outs and those doors were just about the right depth for the Kerdi shower base. Twenty four hours later I could have mortared in the Kerdi shower base but it took me awhile to cut the base to fit so that is the next job. The final wall area was around the shower head and under it on the bit of ceiling that has the shower light. I didn’t mix mortar for these two areas but used the acrylic mastic. 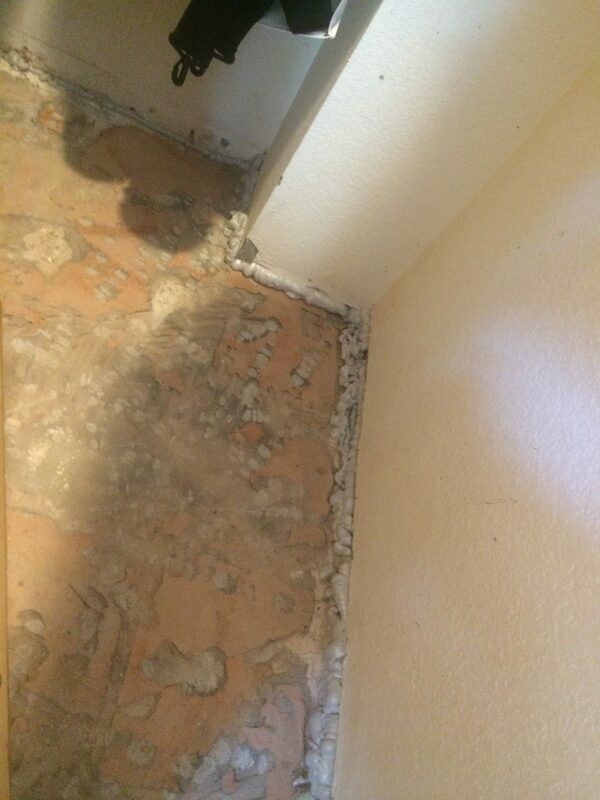 Plain unmodified mortar is specified for Kerdi and that was used everywhere but on the baseboards and this area. I needed a more sticky mortar here and I decided it would be easier to use mastic. My guess is that it will last just fine. I did not have enough dark brown trim tiles left to do this edge. So I considered using the floor and niche tiles instead. I have several of the lighter brown trim tiles but they are thinner than the dark brown tiles. Fortunately a friend who does remodeling was visiting and I asked her. She said using the marble trim would be a better match. 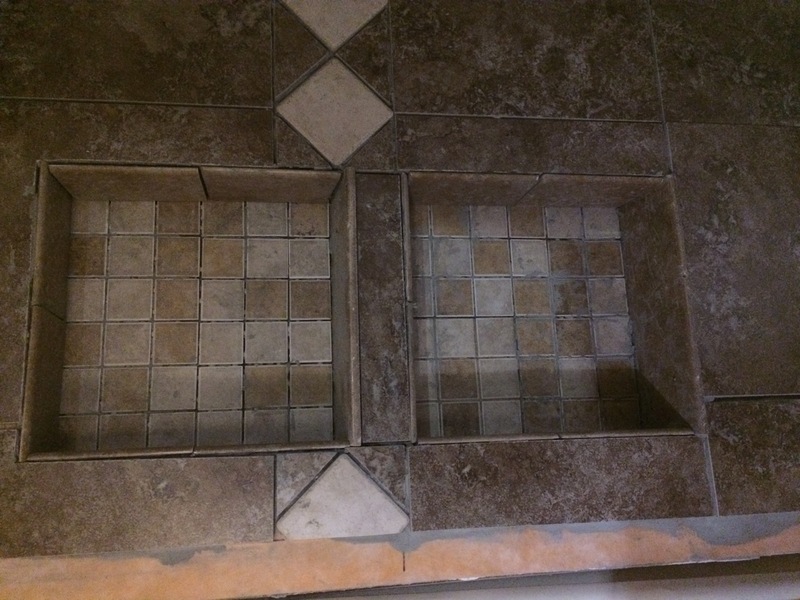 So I found one non matching tile that was close to the trim tile I had left. I just needed one more piece! But the one I bought was thin and brittle and it broke as I cut it. So how could I solve the problem of this edge? I went to the Home Depot fully prepared to drive further to the tile store if I couldn’t find anything. But by standing in front of the tile and considering various non-starters I found tumbled marble pencil tiles. I only needed three so the stiff per piece cost was a necessary evil. To hold the edge up during the install I cut a piece of leftover drywall and held it up with a leftover plastic pipe because I didn’t have a 77” piece of wood or a 96” piece I was willing to sacrifice. 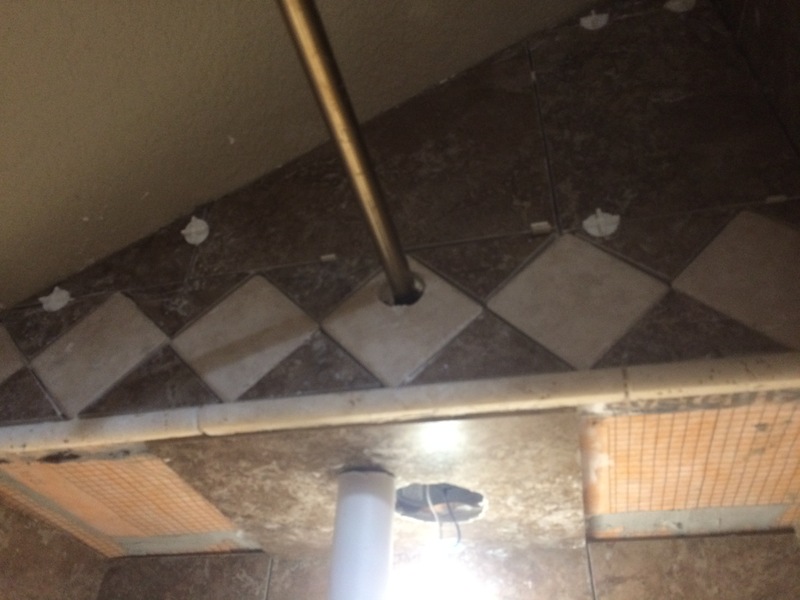 There were two tile pieces under the drywall to space the tile edge correctly. Plywood may have been a better choice. Or perhaps I could have cut a second support. The drywall bent a little and I had to shim the edge tile to make it approximately level. I was able to use the diamond edge hole saws I bought for the granite to make an almost perfect hole for the shower head. Although expensive it is lovely to have good tools that work. But I did cut the hole into two different tiles because the first was slightly off. Above the trim there were just a few more tiles to cut and install. The next area was the small ceiling under this wall. The hole for the light was cut with the grinder wheel. The light trim will cover the unevenness. 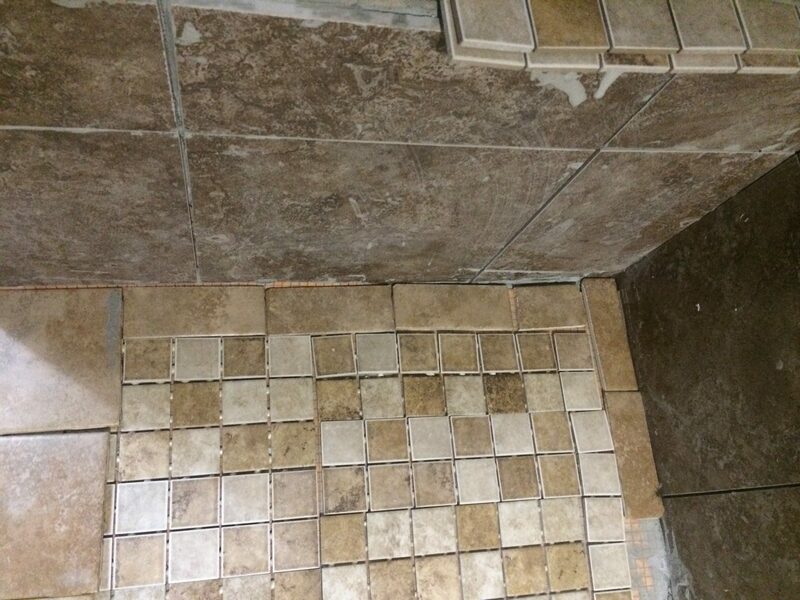 I also had to cut this tile twice because I put the hole in the wrong corner of the tile the first time. It was the mirror image of the correct placement. Ah amateurs. Just to make the job easier I only installed one tile at a time on the ceiling and held them in place with the pipe until they dried. I did one towards late afternoon and the other two the next day, one in the morning and one in the afternoon. Progress on this project feels great. 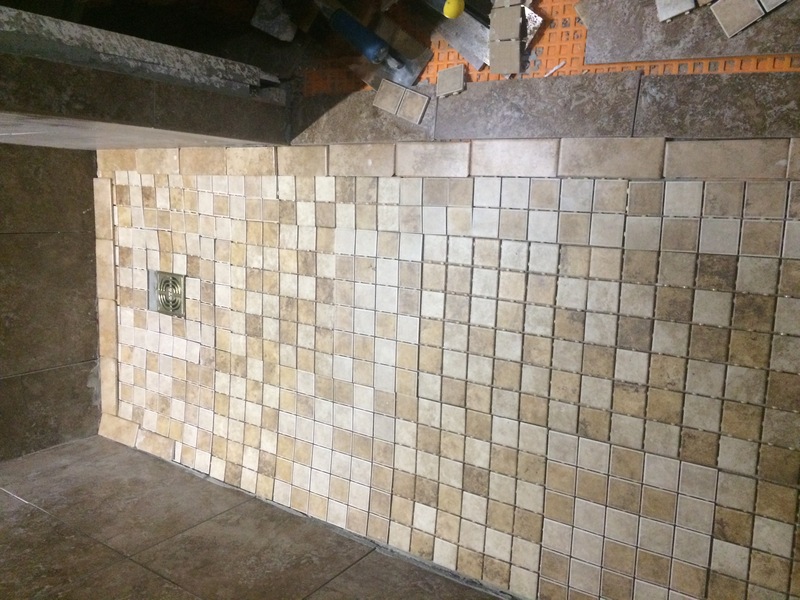 Now I need to tackle the shower floor! 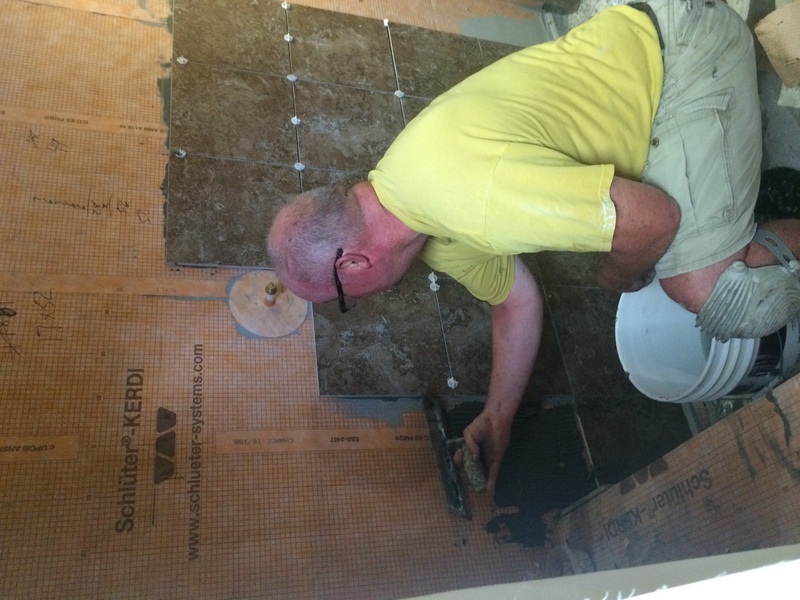 Just before we left on our extended trip away from home I tiled the shower niches. 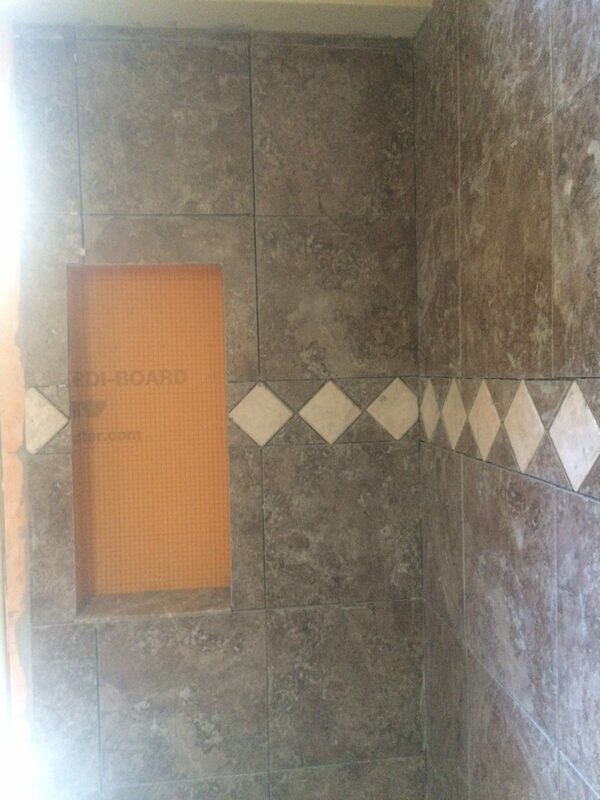 These are Schluter Kerdi preformed styrofoam covered with the orange waterproof membrane. 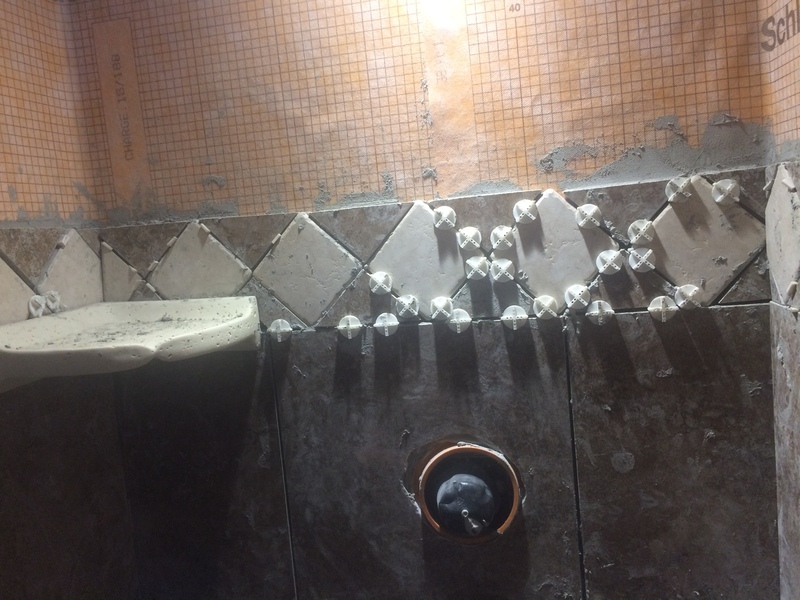 The niches were an area that the handyman who tiled most of the shower didn’t get to. 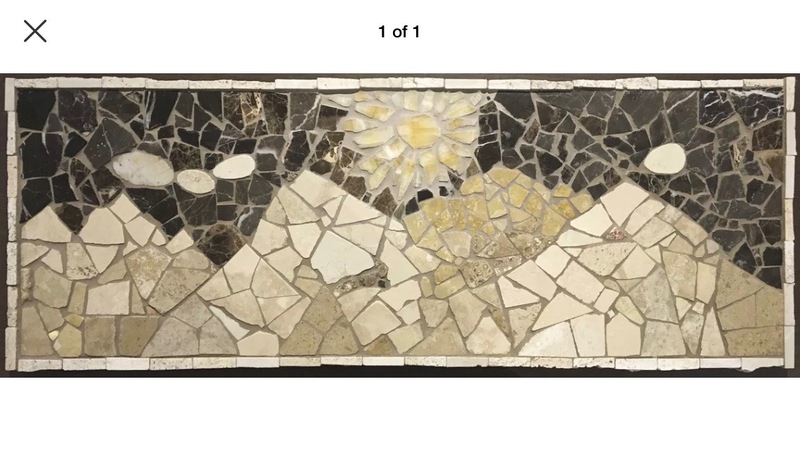 I had in mind to use the floor mosaic for the back of the niches. The tiles are left over from a project at my daughters house. Although I found extra tiles to match I was glad I could select the tiles to use myself. I ended up using pieces of the mosaic that were not in full sheets which worked well for these small spaces. The shelves are covered with pieces of travertine with the edges rounded using diamond pads on my polisher. I tried using a grinder with a 3” Velcro holder but the pads flew right off at the higher speed. The polisher has an adjustable speed that worked better. 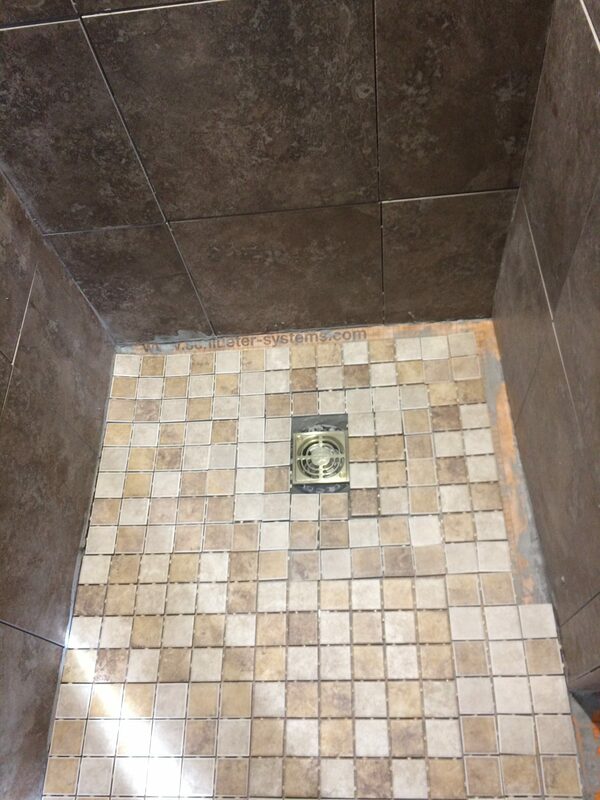 The short shelves are in the front section of the shower near the control. 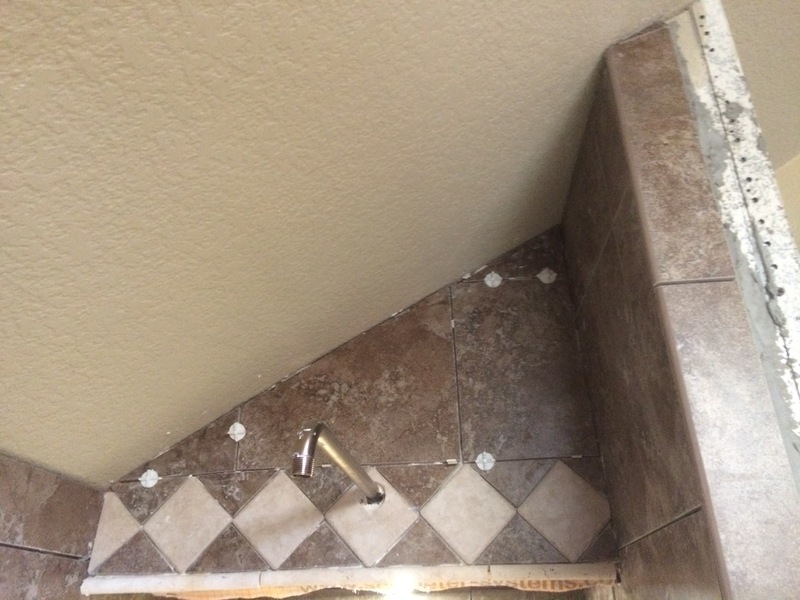 I noticed the tile did not align with the top of the niche so I had to add a narrow piece. I don’t think that error will be too obvious. 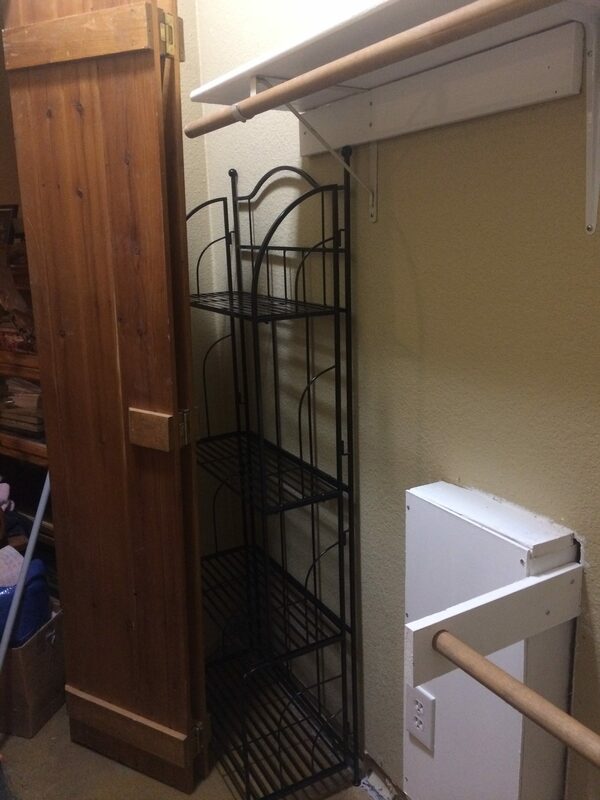 The tall shelves are at the back of the shower over the bench. 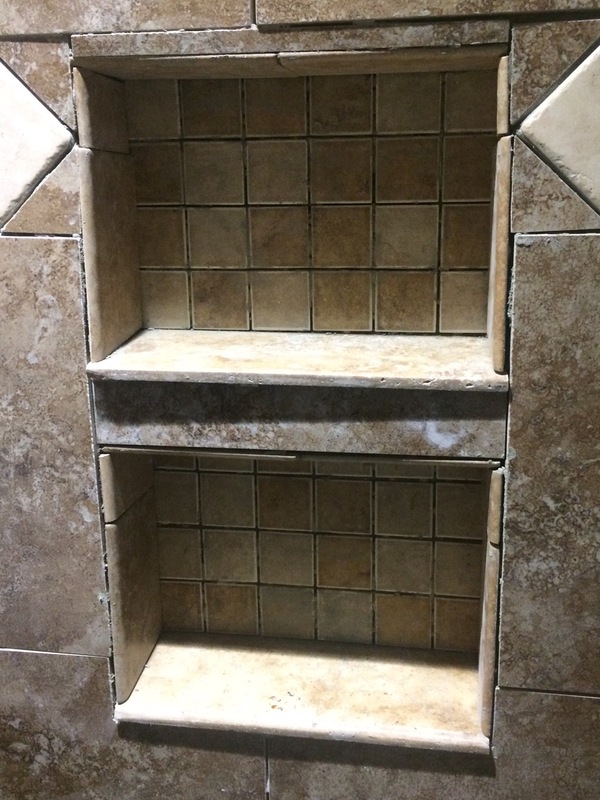 The tile on this niche aligned correctly. I had not yet cleaned the grout off the tiles when I took these photos. But I got them cleaned the morning of the day we left for the airport for our trip. One of the items on the spring/summer list was to fix the kitchen sink drain. I stuck a bucket under the kitchen sink drain because it was dripping when the sink had water in it, and I thought the leak just stopped. I was wrong. Over time it got worse and worse. Finally I decided to take it off and try to retighten it. I bought a special tool to loosen the nut but it didn’t budge it. 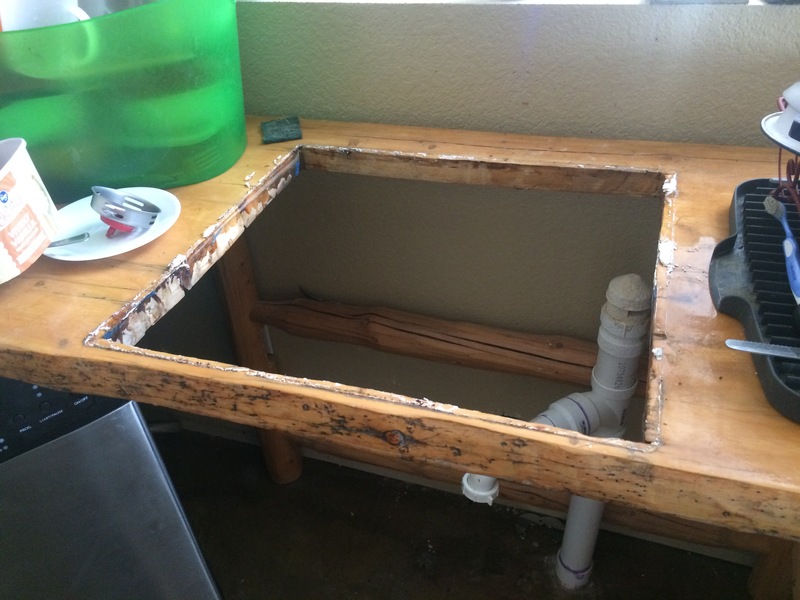 So we had to remove the whole kitchen sink. After beatinmg on it and trying all kinds of twisting, it was obvious the nut was cross threaded. Even with the sink out I could not remove the nut. 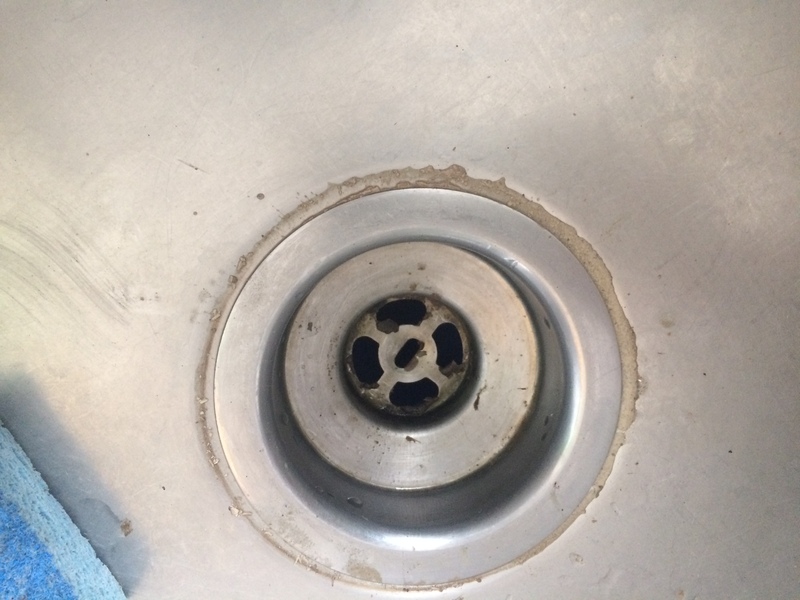 I had to cut off the drain tightening ring with a dremel tool to remove it. No wonder it leaked! 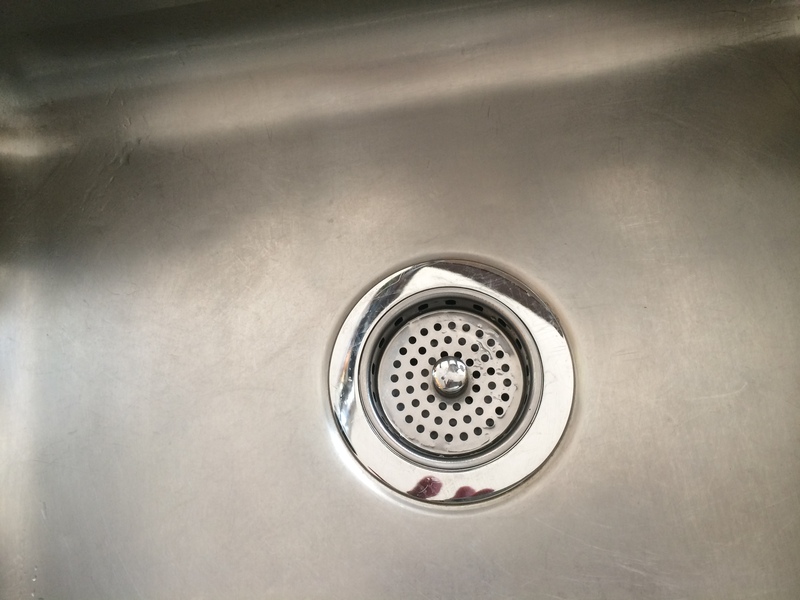 I bought a new basket assembly and paid a little more for a brass hardware connection for the chrome drain. The last one was stainless but this one only came in chrome and it matches the sink faucet. Having the sink out allowed me to touch up some of the rubberized paint that had been knocked off and peeled so that the sink doesn’t have any blemishes under the counter now. I also replaced the trap and related pipes with a black version that I had as on hand. The white was stained and the trap was gross so new stuff seemed much nicer. This was the last project before we left for a three week trip to visit family in far-reaching parts of the country. Now that we are home, more progress must be made. 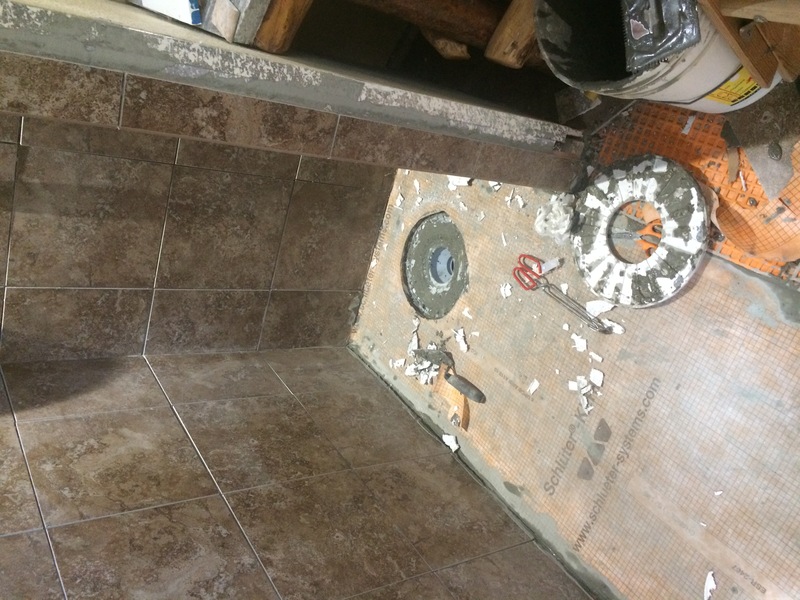 When I hadn’t finished all three tasks from the final inspection list in April by the August 28th deadline I got to feeling desperate that I would never finish the building permit so I looked around for a tile installer. The only thing left on the list is completing the family room bathroom shower. I contacted a few tile installers and consulted the Nextdoor app to see if my neighbors had any recommendations. I don’t know what it is about my jobs but it is difficult to get someone to return my calls, or be available, or do estimates. Tim King who used to be a part time handyman but has started working at it full time made room in his schedule for the job and started in two weeks instead of two months. 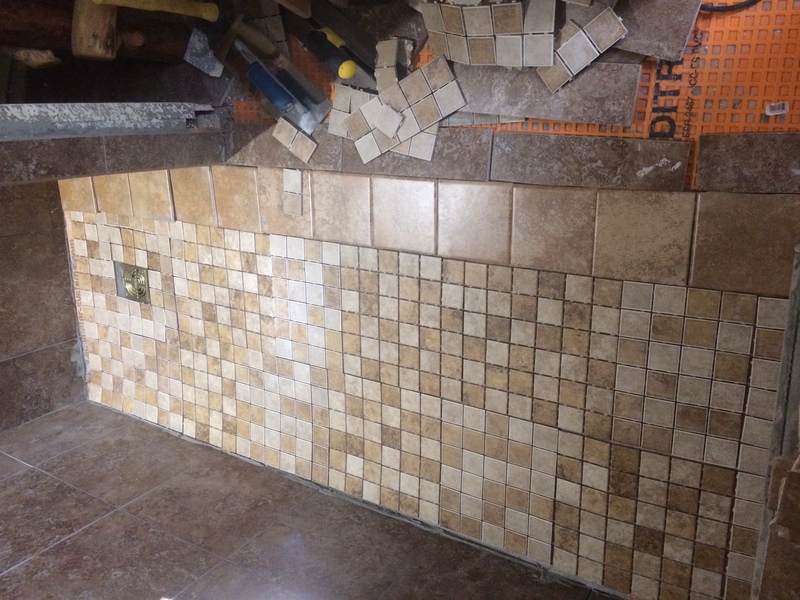 I was very happy that he showed up on the scheduled day and got to work installing the tile. Originally I was going to create a mountain mural and put it centrally in place of three regular tiles.This was my inspiration after downloading several examples. My imitation still needed work (lots of it) when Tim arrived. 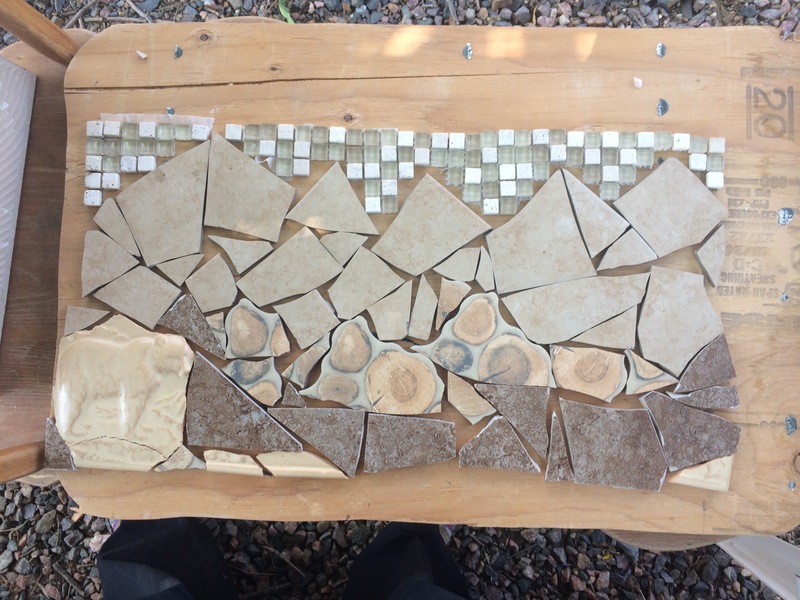 After toying with the idea of just leaving out three tiles and filling them in with the mosaic later, I gave up and had Tim install a trim feature instead. I got some 4×4 tumbled marble tiles when my kids moved to Germany. They were their leftovers and the tumbled stone looked great with my tile. I cut all the triangle tiles but it was a little tricky to install and took longer than anticipated. 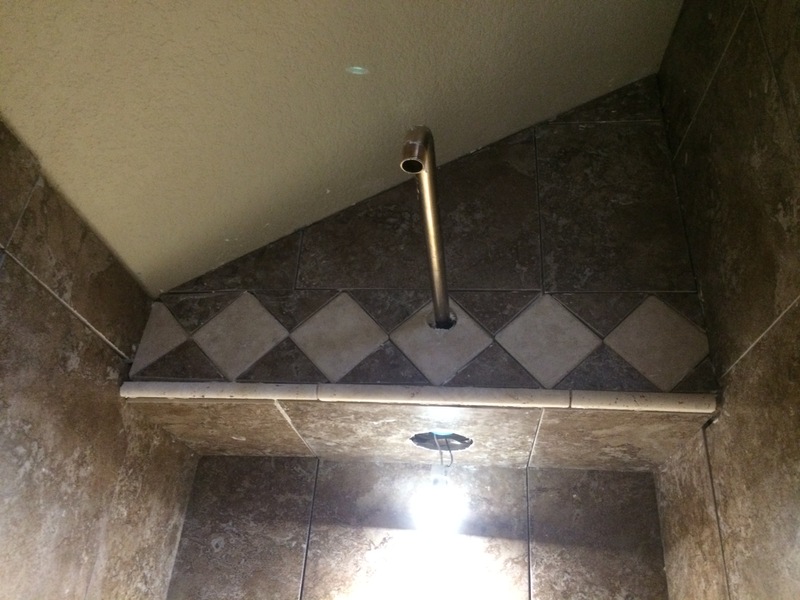 I like the look of the tile trim though it is a bit rustic due to varying sizes of the tile triangles. 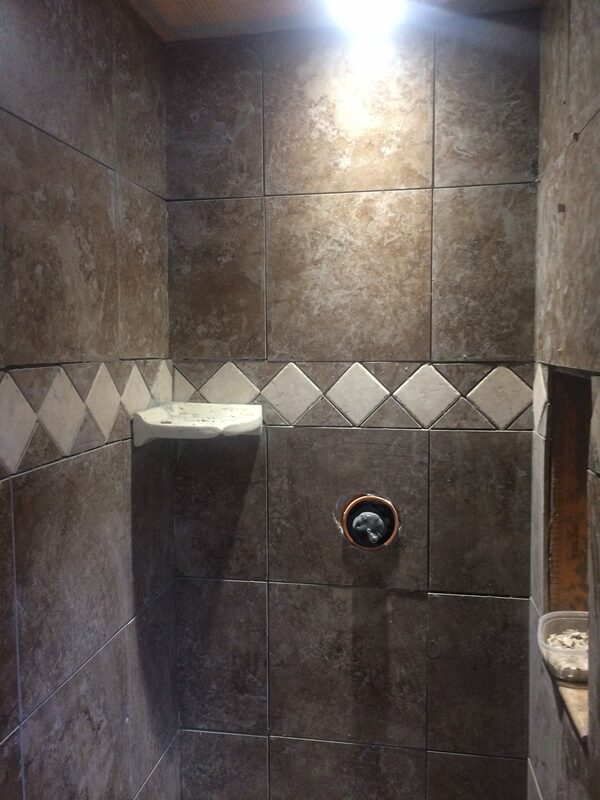 In the time Tim allotted for the job, all of the walls to the ceiling and the trim tiles were installed. 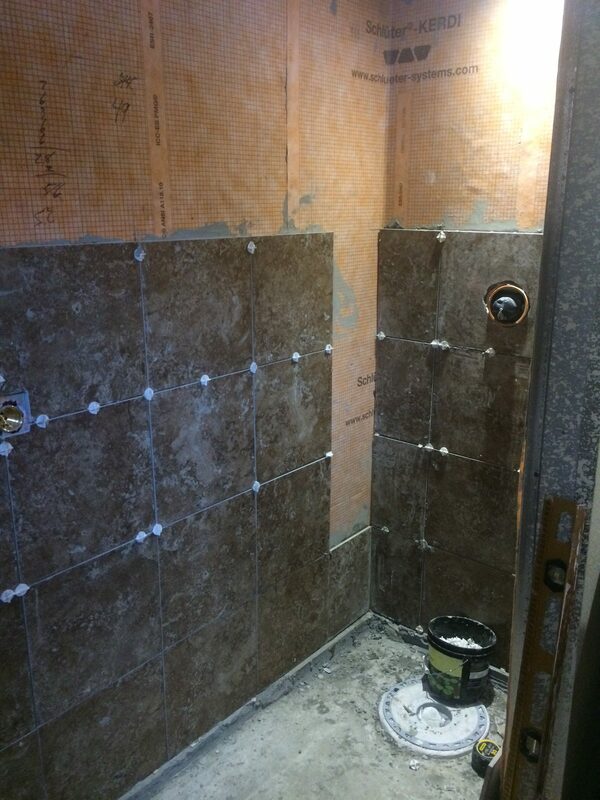 I still have the shower head area, a bit of ceiling, the niche tiles and the Schluter Kerdi shower floor system to install and tile. 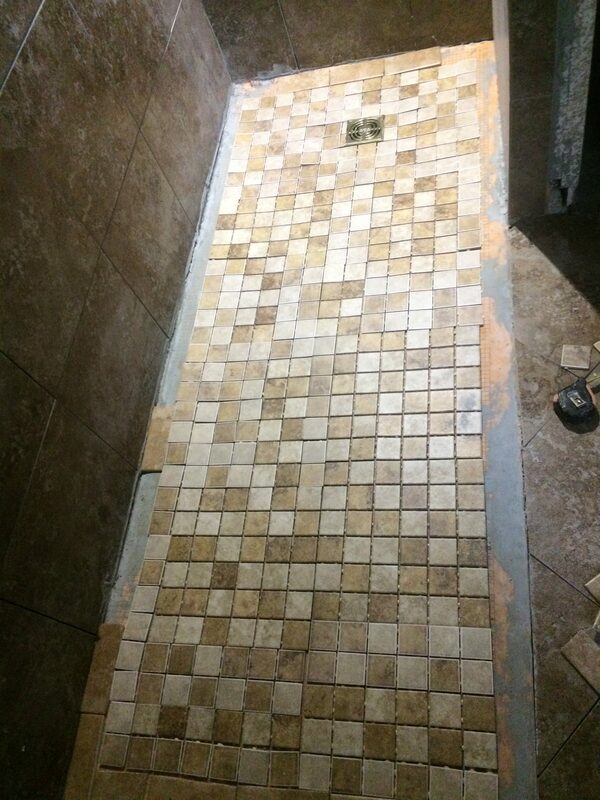 I’ll be using 2×2 mosaic tiles for the niches and floor. 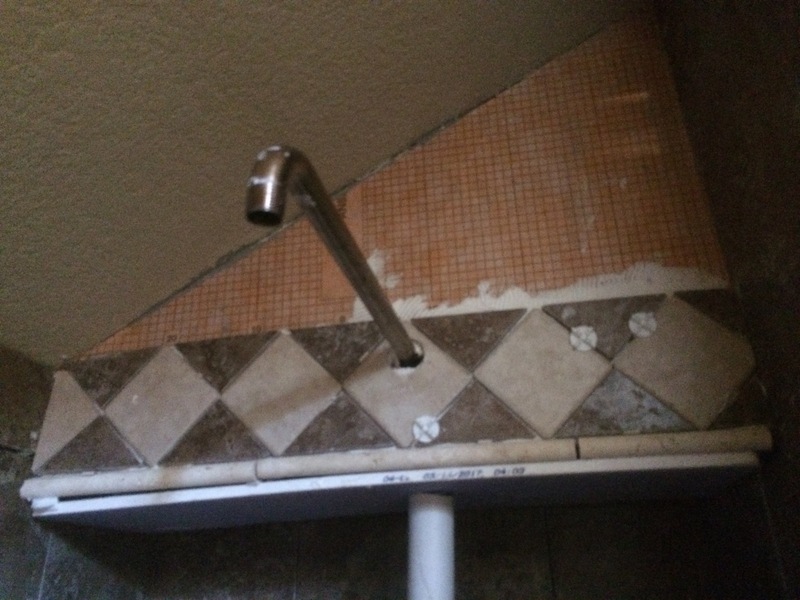 I’m thinking about a row of trim tile at the shower head wall. Hiring at least part of the job out helped to make progress so thanks to Tim King! Now I better get going on the rest. He might have time to return and help finish in a few weeks. I’ll have to see how the project goes. We need to get the last of the decorative items out of storage and decide what to do with them. 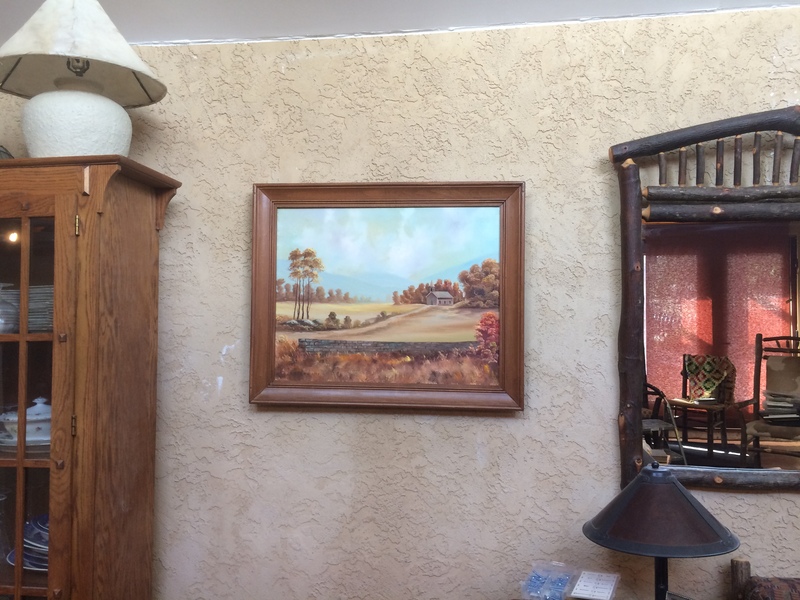 I have always liked this serene painting that I bought at a second hand store in Indiana years ago. It has been in our houses since then and I wanted to keep it. The frame was a bit the worse for wear so I sanded it and polyurethaned it and looking much more spiffy I tried to hang it in the living room. I have been using the ramjet and power nails to create hanging hooks on the brick and stucco walls. When I sent a nail into the stucco wall about where I wanted to hang the frame the nail went right through the stucco. That surprised me but I didn’t stop to think why that happened. Instead I tried a metal butterfly bolt in the enlarged hole. It wasn’t seating well so I used a hammer to send it deeper into the hole and a huge spark rang out! Unfortunately I had hit a power cable going to the outlet below. It seems that the chances of hitting a cable, the only one in the wall had not occurred to me. With the breaker off I took out the bolt and had to enlarge the hole to repair the wire. Luckily I only pierced one wire and didn’t short it. So now the painting hides a huge hole in the stucco! I should be able to repair it eventually with the acrylic stucco and caulk. 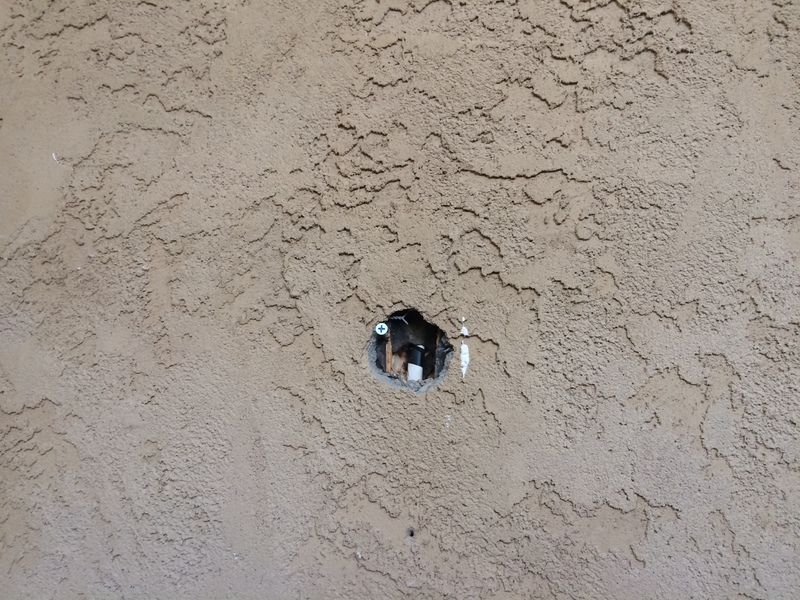 But I also found out that a hammer easily breaks the stucco off the wall in case someday it needs to be removed. The front entry is spilling over with stuff. 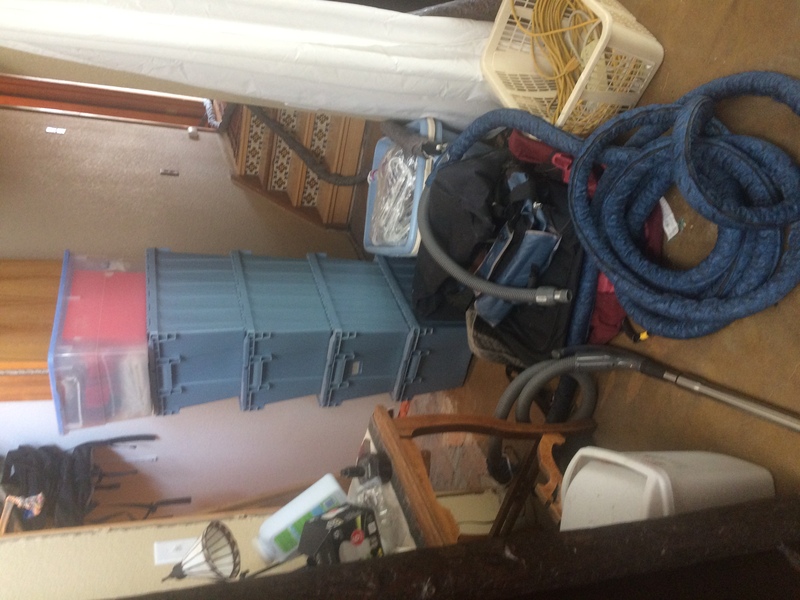 It is the staging ground for recycling boxes and recent tools and stuff going out to the RV and extra stuff from my kids move that I haven’t organized yet. Given my lifestyle it may always be getting cluttered but I hoped having the front closet set up for storage and coats would help with the clutter. 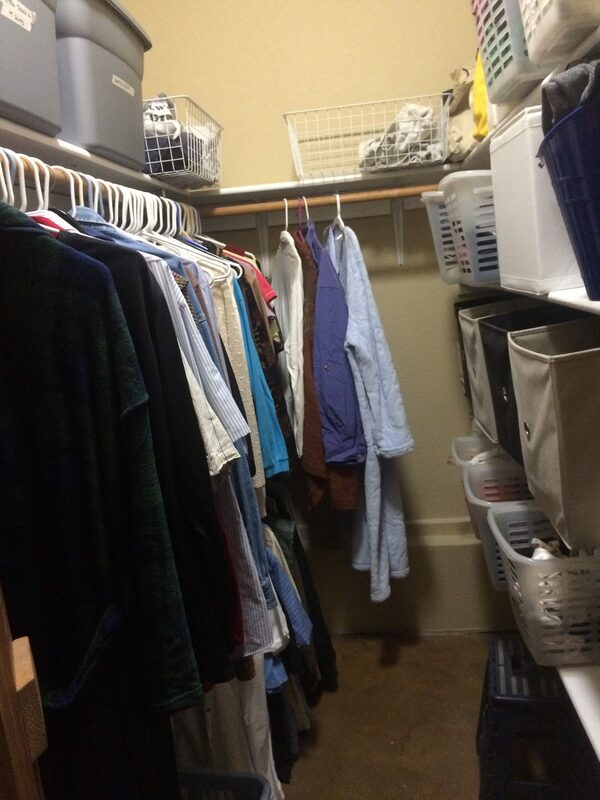 So it was the next closet I tackled. 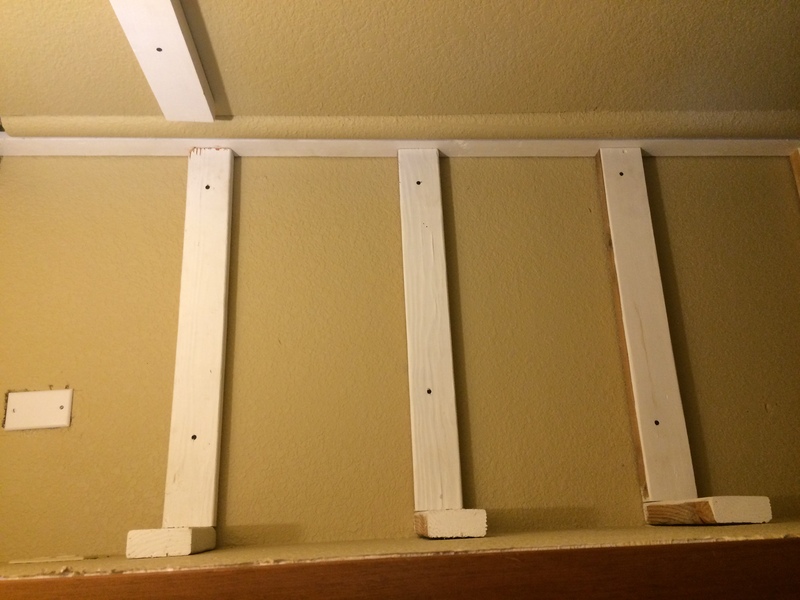 The closet poles I had on hand were a bit too short for this closet so I used 2×4’s instead of 1×4’s to hold the shelves. Attaching pole holders to the 2 x 4’s allowed me to use a shorter pole. 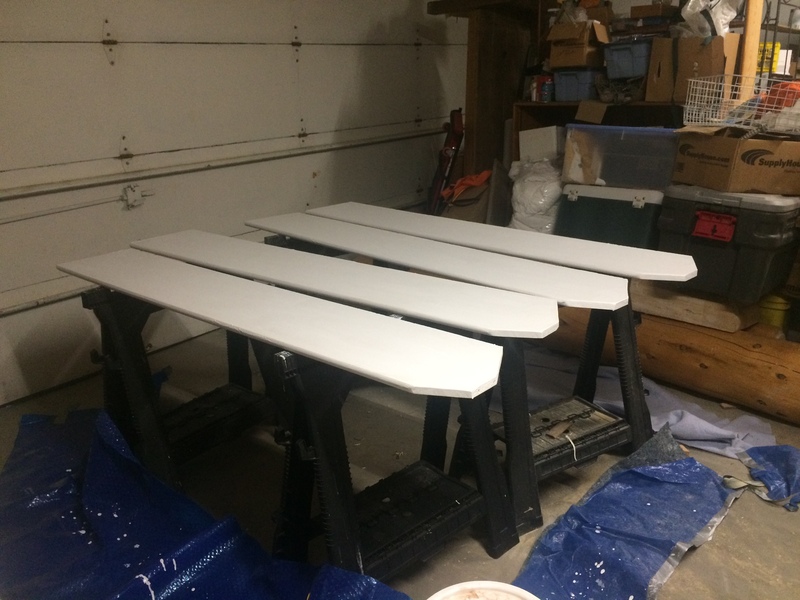 I was able to take advantage of the salvaged lumber pile for the boards again, With two coats of white paint no one can tell some of the boards were gray and weathered. 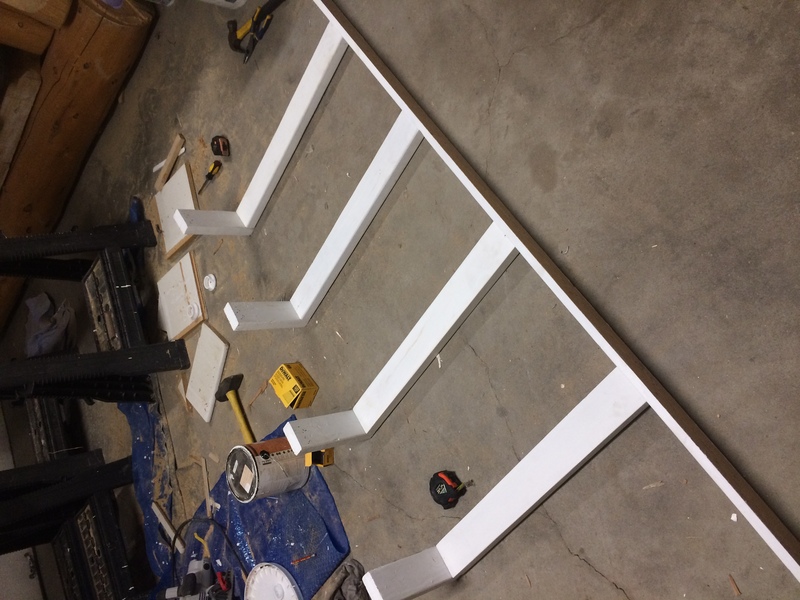 I assembled the support system as a set because there was no backing for drywall between the support post and the wall in the corner of the closet so there was an unfinished gap. I bought a 1×3 to fill it and attached it to the shelf supports with my finish nail gun. With the help of a friend we made use of some of the new storage at least temporarily while clearing off some of the stuff I moved from my mother’s apartment when she passed away this summer. I had tried to hang the closet door several months ago but the wall opening was not square and the old door frame didn’t allow the door to close. 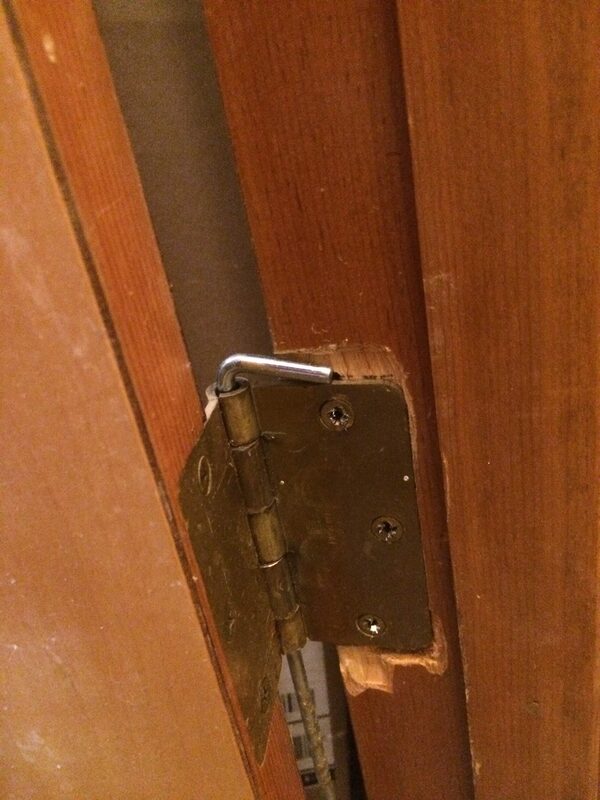 I had to use the reciprocating Sawsall to take off part of the 2×4 on the right to allow the frame to clear the door. I messed up the interior drywall with the saw but it was not a fantastic job anyway. 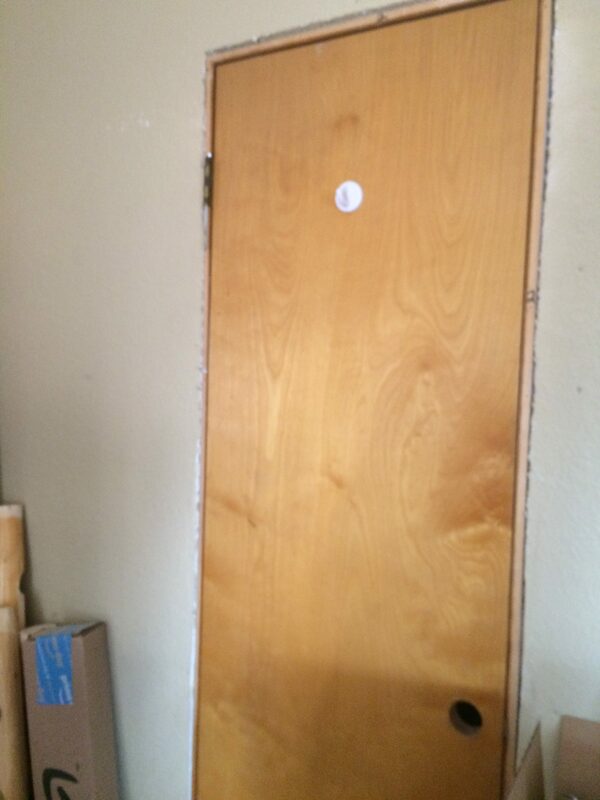 Then when I finally got the door to fit the space, the lower hinge was bent. So I took a hinge piece off another door and it would not line up with the hinge cutout on the door. I tried moving it up and down and still could not get it to fit, having carved out an ugly space above and below the hinge. I finally got the hinge to align by hanging the door from the top hinge and then screwing in the bottom hinge while it was attached to the door. Notice I also could not find the hinge pins. This door with its unsightly hook was the narrowest closet door I could find in the stash and it barely fit the frame. 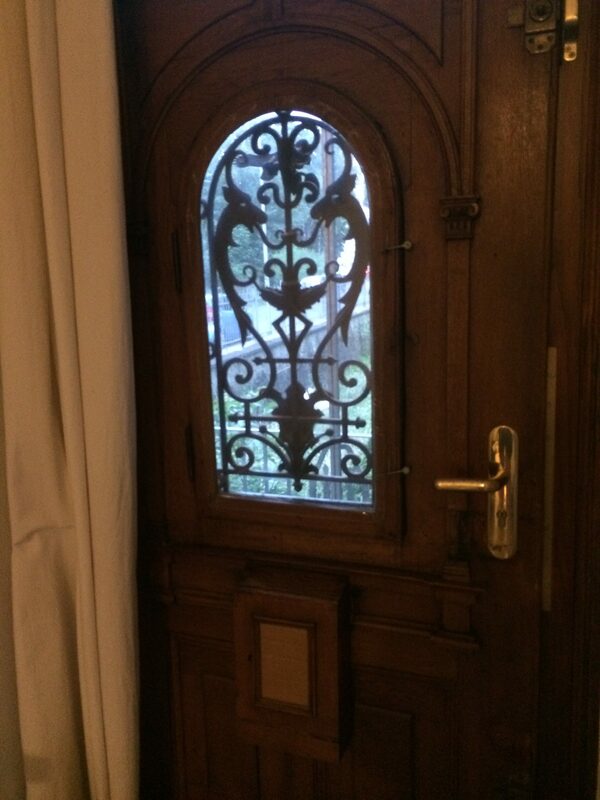 I will have to do some upgrades on this door in the future. 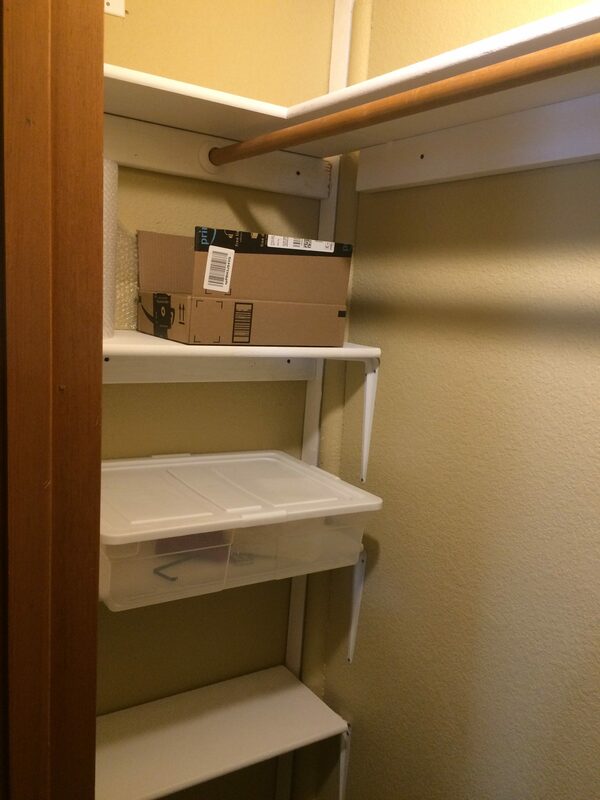 I’m glad the closets have poles and shelves. That will help us stay more organized as we do finishing work inside the house. The master bedroom has been occupied several times since I set up the furniture in there. 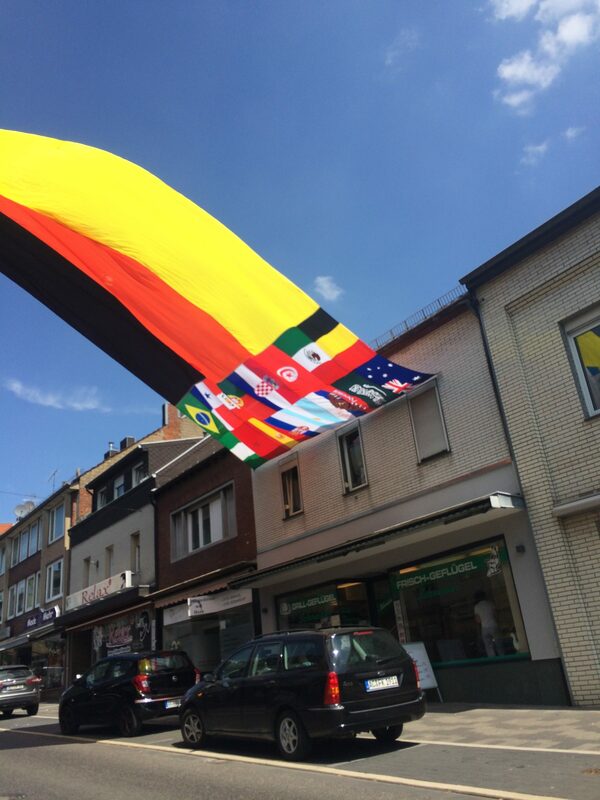 Our daughter and her family moved to Aachen, Germany at the end of May. They emptied their house and rented it so they needed to be out before the big move. They spent the last few days with us and the parents slept in the master bedroom. The kids slept with us and in the guest room. Then my sister visited and she stayed in the room. It was very hot then and she said the room stayed comfortable because of the effective ceiling fan. But the guests are gone for now, the master bathroom is finished, (mostly) and I wanted to move to the master bedroom. Our current bedroom will be Dave’s office and his desk is already in there. I moved the filing cabinet in there too. We will leave the bed up so that we can also use it as a guest room. Before we could move though, the closet had to be set up to hold our clothes. So I have been working on that all week. I knew I wanted shelves on one side and clothes poles on the other. I also put a clothes pole at the back. 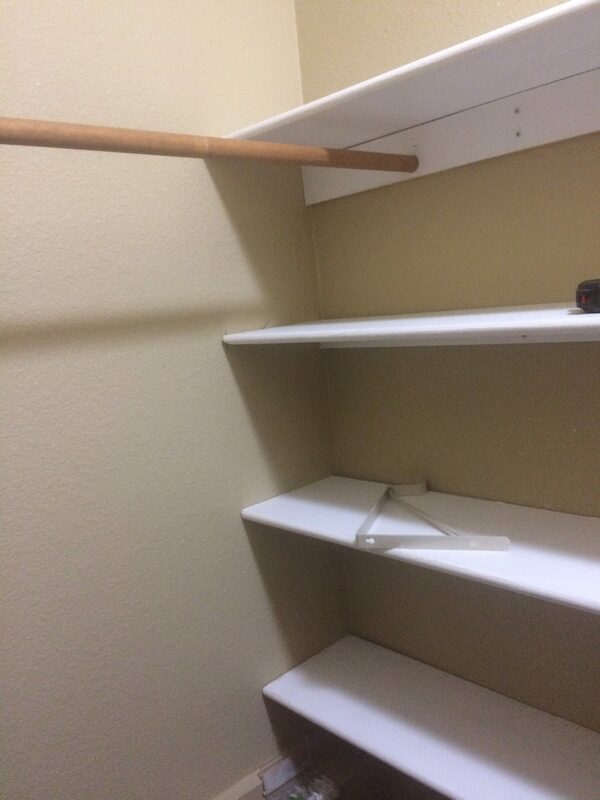 The front of the closet has a bit of an odd angle, so the shelves had to be cut to fit. I had disassembled all the shelving in the old closets and the entry and saved the particle board shelves. So I had several to choose from to assemble in the master closet. I also saved the support boards and pole hangers. Plus I had several angle supports left over from the ventilation shaft/light shelves. 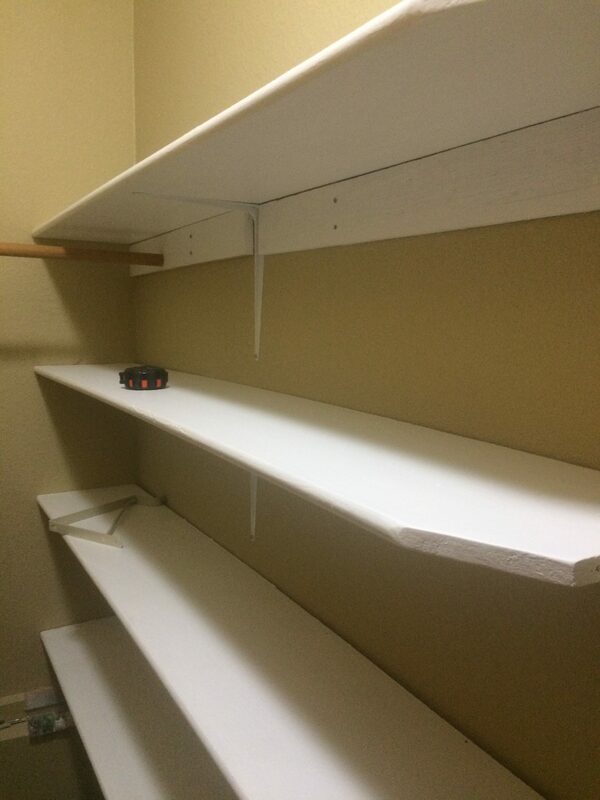 All the shelves and the support boards got a light sanding and two coats of paint. The distance between the shelves was figured to hold the baskets that I like to keep my clothes in. I prefer baskets to drawers. The original support boards had holes drilled for the closet poles. So I used this system again to attach the poles. 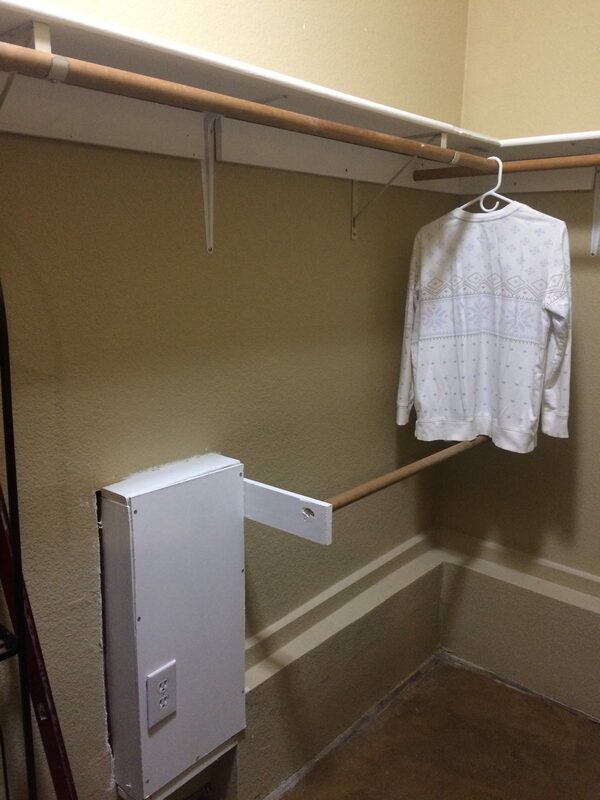 Closet pole held by support board. On the other side of the closet I had to enclose the vent and electrical connections for the crawl space ventilation fan. The duct was a bit too wide to fit in the 2 x 4 wall. 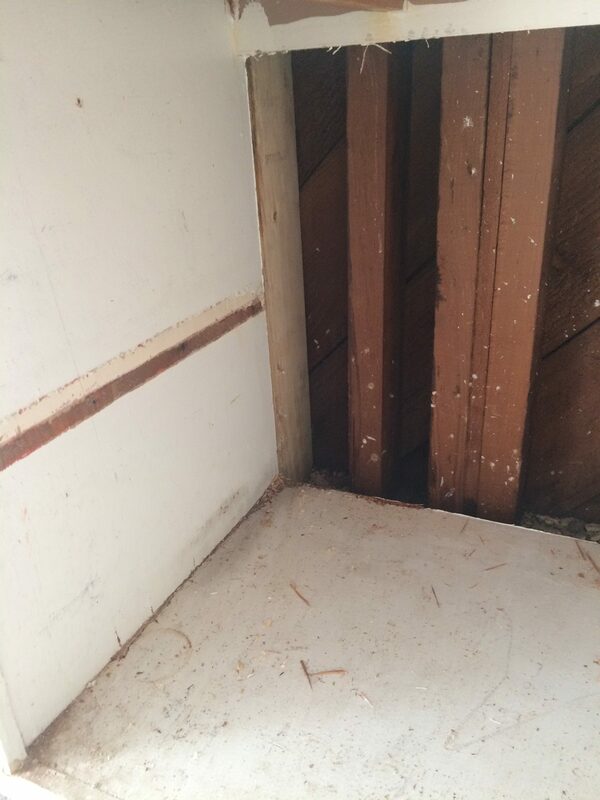 This is an inside wall but the bottom of the wall connects to the crawl space. The other side of this wall is the rear hallway and outside door. That is where the fan vents to. The space was framed with 2 x 4’s so I cut 8″ wide boards from the salvaged wood rack for the box and tacked them to the inside of the framing with my finish nail gun. Then I topped the sides with another board and attached one to the bottom too. There was a fiberboard panel that was covering some plumbing in the original house and I cut that to size for the cover. It is screwed on so it can be removed if necessary. I also wired an outlet into the electrical connection for the fan. Another outlet might be useful. I found that the circuit that was labeled for this fan wasn’t the right one though. I’ll have to update the circuit list. The box and the cover also got two coats of paint. 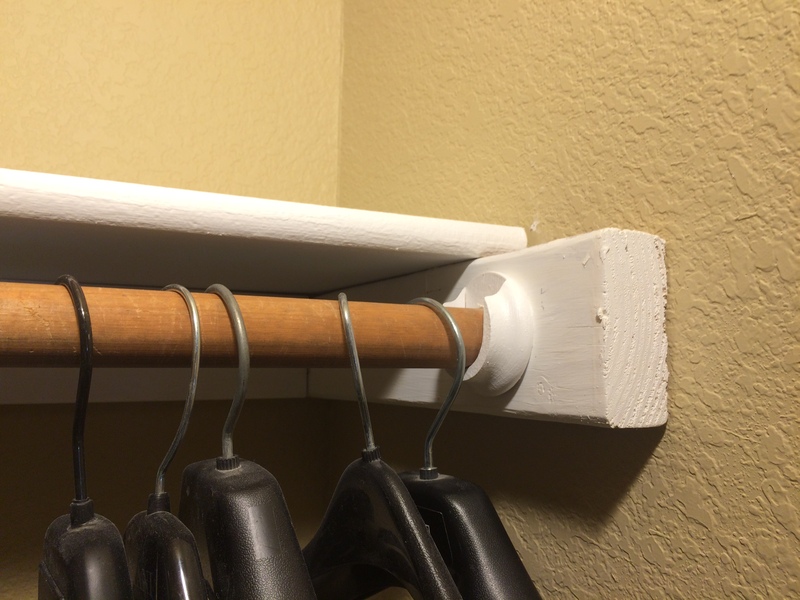 Closet poles with ventilation fan duct box. 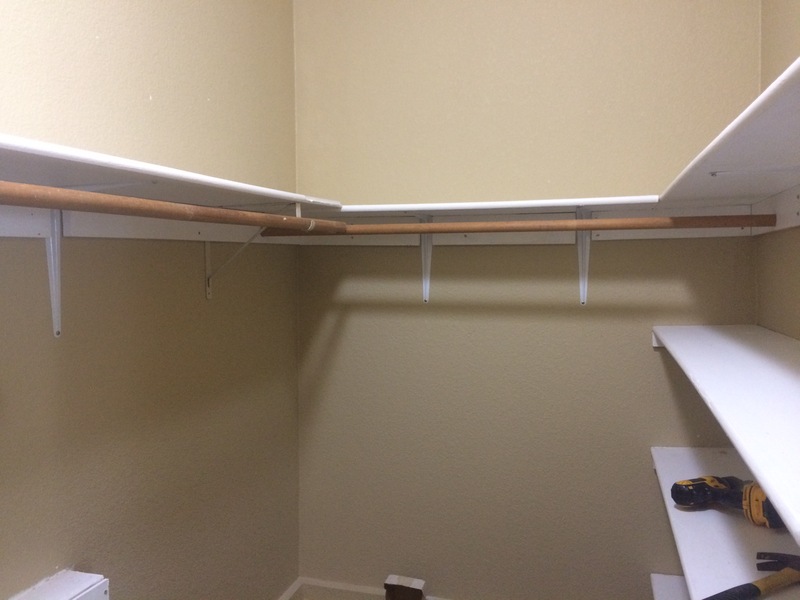 Since I started on the shelf side of the closet and continued the clothes pole from the hole in the support board, I matched that height with the other clothes poles. So I had not figured a good height for a double decker pole area. I kind of lucked out having just enough space to double the poles in one area. Where the shelves meet I installed straight metal braces for more support. I had to go shopping to pick up these metal braces and while looking for some that were less than $3.97 for a pair, I found this clearance plant rack at Big Lots. For only $12.47 I knew it was about the right size. It is perfect for the narrow corner and can hold shoes neatly. I had been looking on craigslist for something like this with no luck. It was a great find. The closet door will be hung from this side of the closet. It is opposite the matching door in the bathroom. And happily Walmart had the braces for $2 for a package of four. Bargain find, clearance plant rack. I successfully moved all the clothes in our old closet to the new one with room to spare. I will hang the coats and jackets in the entry closet instead of the bedroom. Sealing the gap between the walls and the floor in the storage closet has been on the to do list for some time. 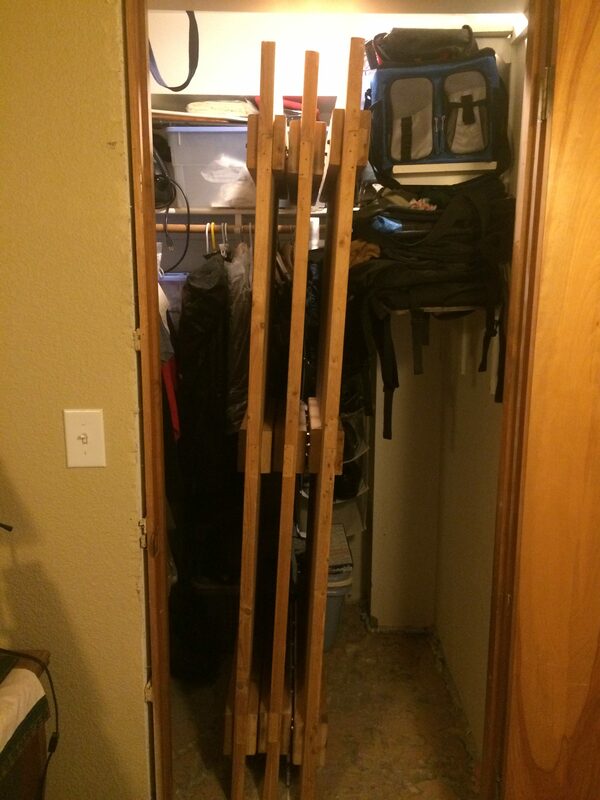 I emptied the closet and vacuumed the floor to access the gap on the outside walls. 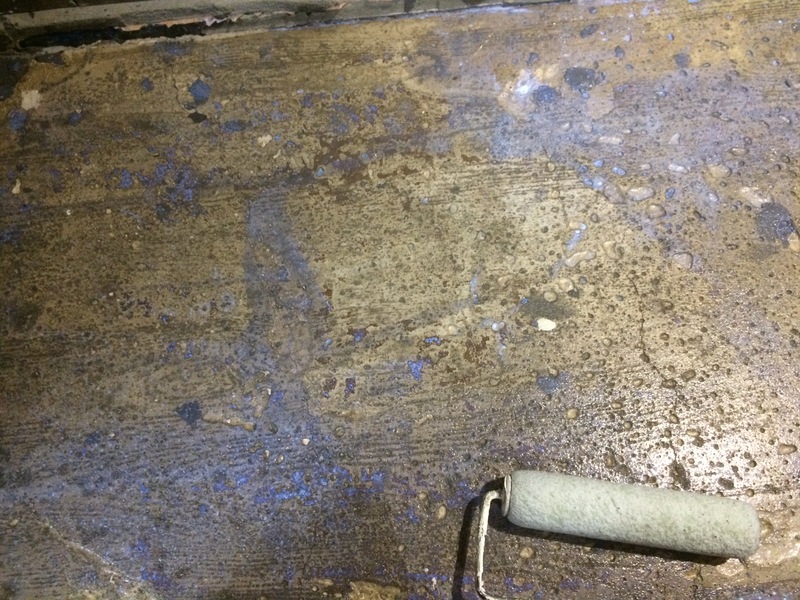 The closet floor is part of the original slab. 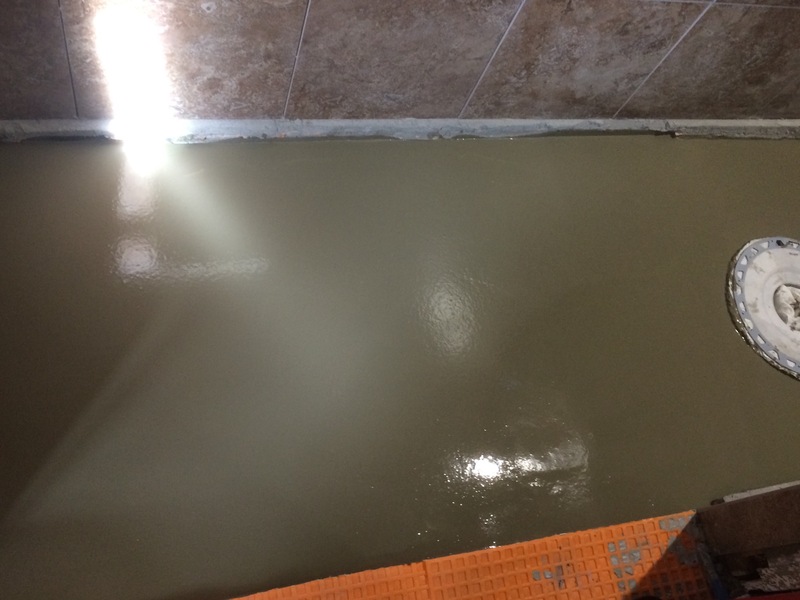 When the tile was removed from the floor we intended to break out this concrete. But since the block wall is sitting on it and we didn’t want to tear that down we kept the existing slab in the closet. 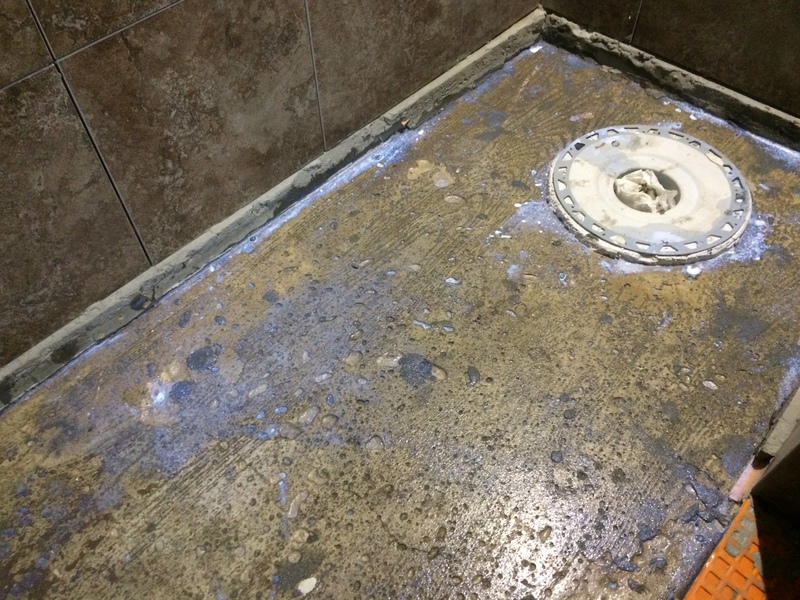 The floor is quite rough from removing the quarry tile. Eventually I will knock out the lumpy cement and lay tile. With the floor cleared out and cleaned I used spray foam to seal the gap. Then everything went back into the closet and I also moved three of the big wooden doors into the closet. I had to get them out of the way to get shelves and poles in the master closet. I have again set up the 1/3 HP aquarium chiller that I bought in 2016. This time outside so that the heat from the chiller is not released in the utility room. The controller is inside and the wiring and piping is routed through the outside air vent for the wood stove. 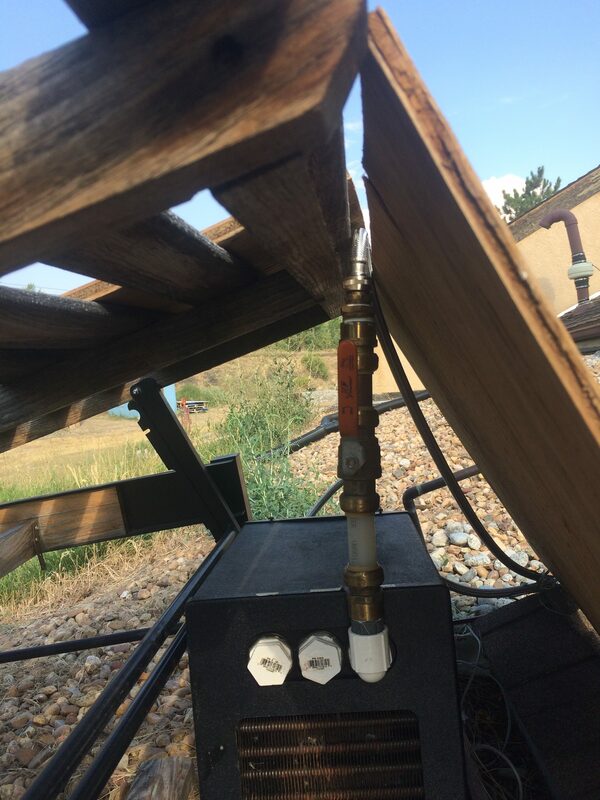 I did a similar test with well water running through the floor piping last year, and it seemed to cool the floor but I didn’t keep it up worried that the constant flow of well water might have an impact on our water supply. I was capturing the water used in a barrel outside and then using that to water the fruit trees. With the chiller itself outside I used the existing water in the radiant loops to feed through the chiller and back into the floor. I tapped into the system through the valve drains. The drain valves feed a hose that allows me to let air in the piping escape when I start the heating system in the fall. I put a dual valve on the hose spigot and attached a long 1/2″ flexible stainless hose to that. 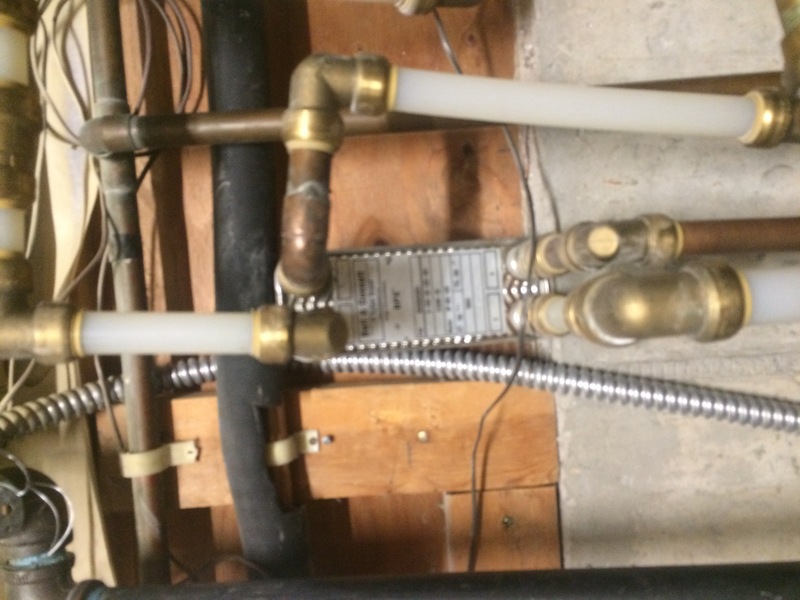 The return pipe is attached to the cold water return for the furnace but the furnace is separated from the flow with a shut off valve. 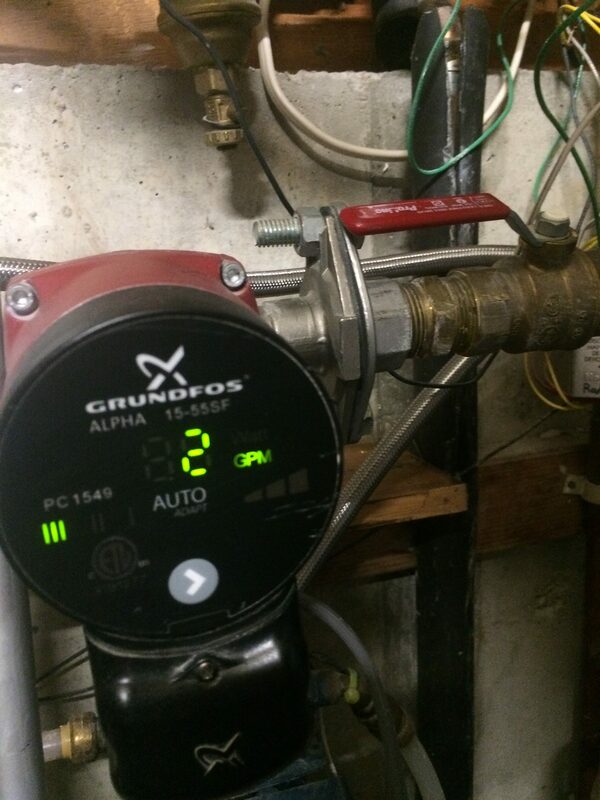 The chilled water flows through any zone that has an open drain using the system pump which is disconnected from the zone valves and plugged directly into the chiller controller. 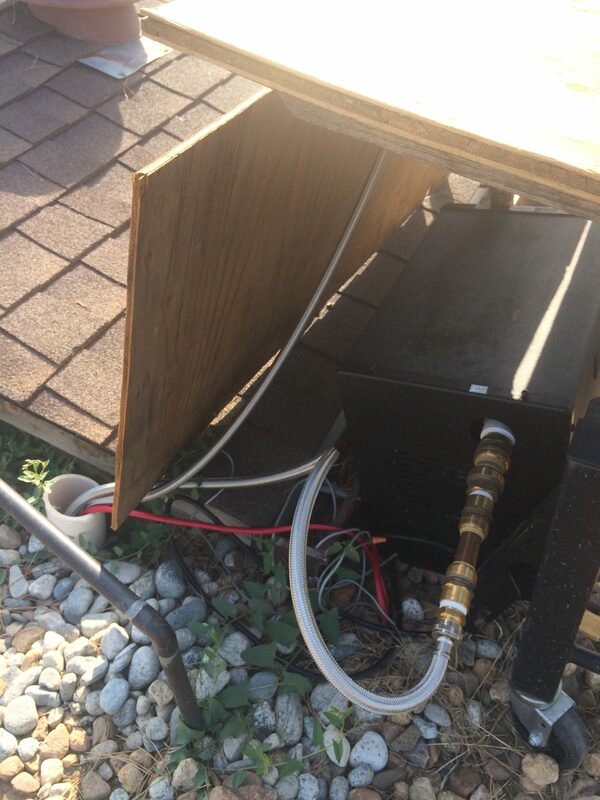 The electrical cord and hoses are threaded through the outside air intake for the wood boiler and that duct is disconnected for these pipes to use that access to the outside. I didn’t break the drywall shown in this photo, this was an area the installers had difficulty reaching because of the water tank. Eventually I will have it fixed. I cobbled together a bit of a shelter for the chiller outside. The chiller is black so I was trying to keep it sheltered from the sun. I had to cut the pipe for the duct to thread the wiring and the hoses through it. 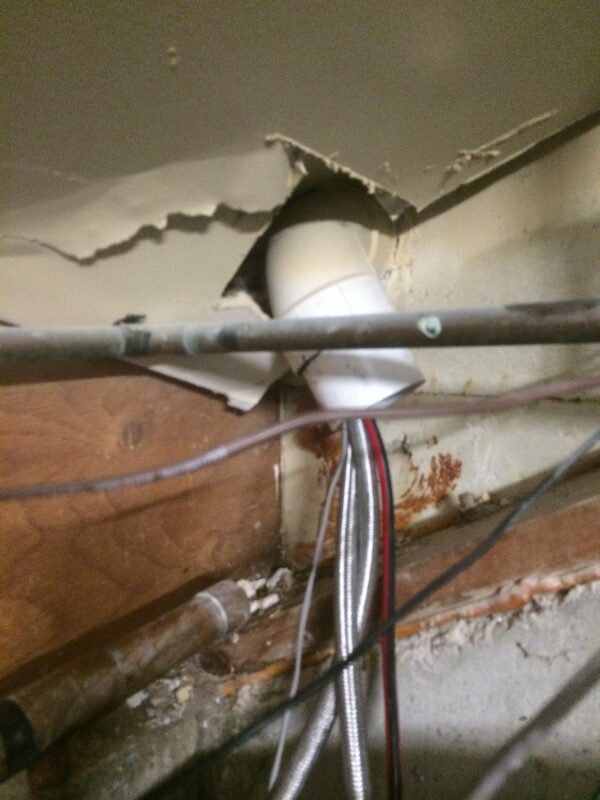 but a shorter pipe will work as well for the winter air duct. The big question is does it work? 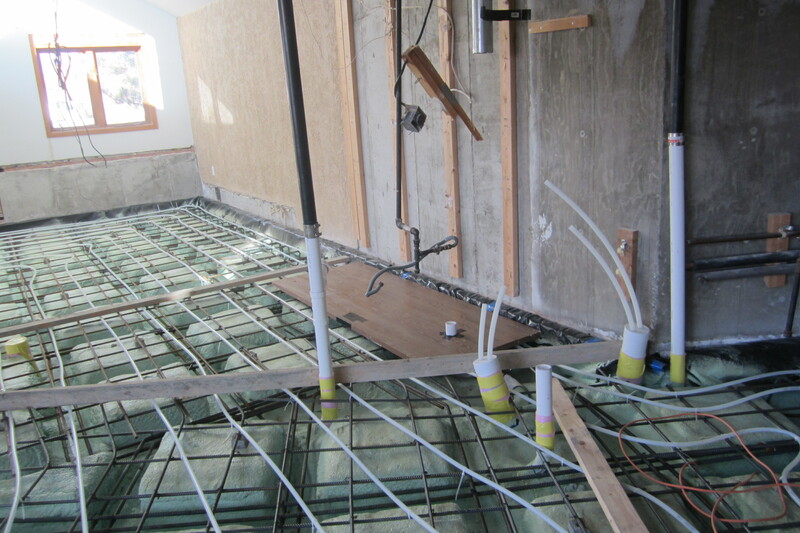 It does cool the floor which helps keep the inside temperature below the outside hotter temperature. The controller reads between 69 and 73 degrees when I look at it. However the cooling is not enough to overcome the heat being radiated into the house from the trombe wall, appliances, and occupation of the spaces. The temp inside hovers around 80-82 when the outside temperature is above 89. But it does not seem to get hotter than that. With the ceiling fans inside it is tolerable. At night the temperatures get lower and I open the windows and use a fan to blow cool air in the house, but even if the outside temperature is in the 50’s at night the house does not get below 76 degrees. It just holds heat really well. I added a zone at a time and when I added the last zone it appeared that the floor throughout did not get as cool. So it seems that the best setting involves three of the four zone valves. The last zone is actually two separate piping loops and that is the one that seems to stretch the system a bit too far. Although it has not seemed to make a difference in the daytime indoor temperature to have a less cool floor overall. I don’t have a temperature reading for the floor, but it feels cool to the touch like a concrete floor might if it were in contact with the ground, which ours isn’t so it is not normally cool without the chilled water running through it. 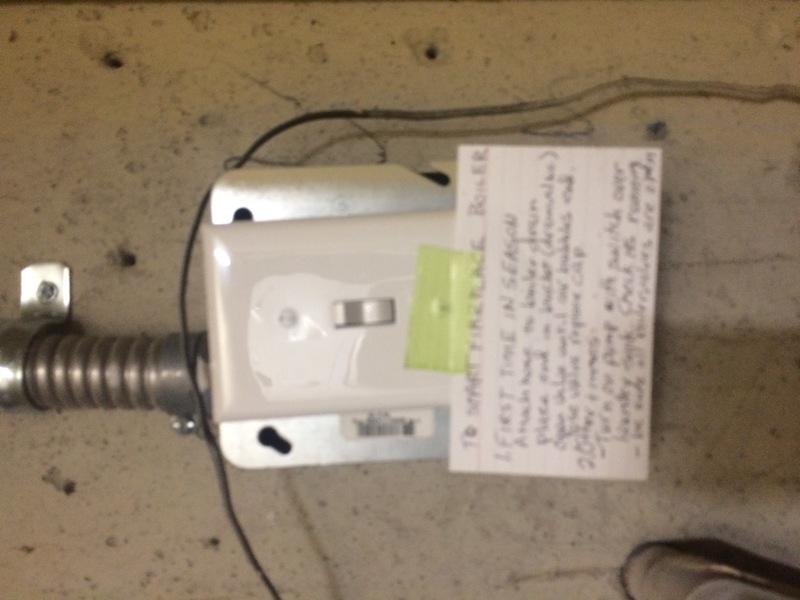 I started the Energy Recovery Ventilation system again but found that the variable switch really wasn’t variable. Nor did it work to turn the system on and off. But it was running the ERV at about half speed or 3.24 volts that were not being modulated by the controller. I am guessing I have something wired incorrectly. So I ran the ventilation for a few days but now I’m hoping to fix the on/off so I disconnected it again. What a long process this has been. And I still don’t have a very effective cooling system in the house but some cooling seems better than none. It’s been a slow summer for home progress. A series of family visits and the passing of my dear mother have taken our time and energy. I was also hospitalized three times and I’m getting tired of it. I’m having complications from emergency surgery I had in 2016. Was referred to another specialist so we’ll see if anything can be done. 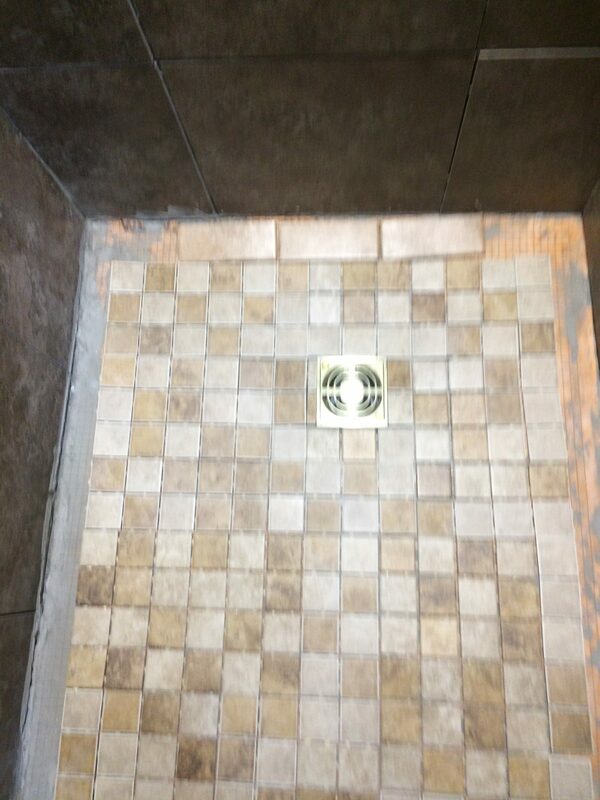 In the meantime my biggest project is tiling the last shower but I can’t get motivated to start. Now that it is late summer and has been very hot I’m working on modifications to alleviate the heat. 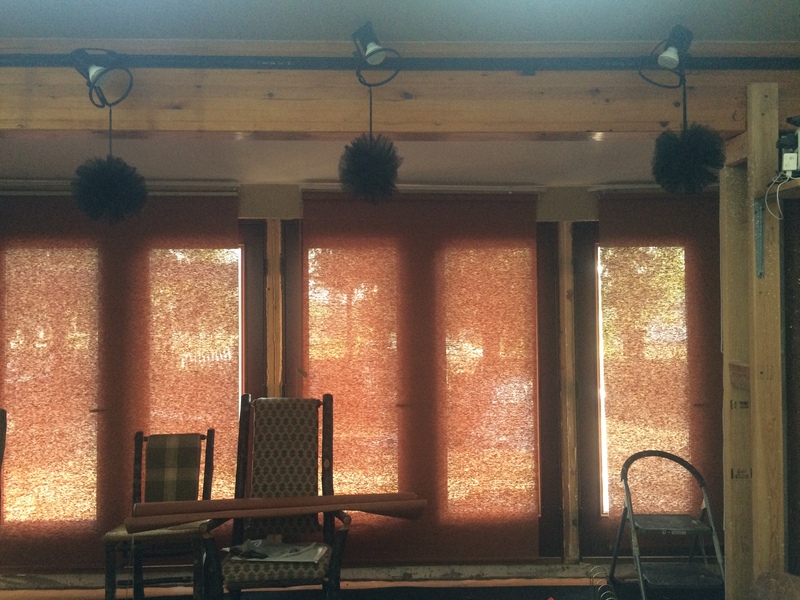 The latest has been installing shades over the sliding glass doors. These are shades I purchased from a craigslist ad. I only purchased four of them, all 56″ wide. I believe I paid $40 for them. I bought these to hang last summer but had them in storage for a year. Just too many tasks to get done. 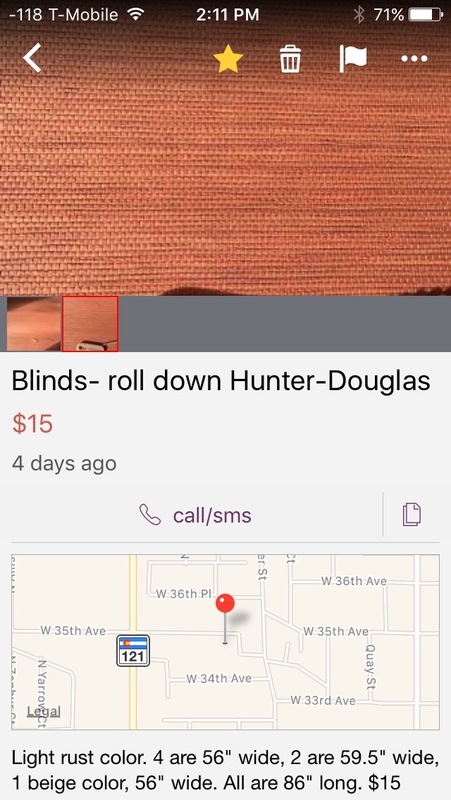 They are supposed to be Hunter Douglas shades and they were apparently purchased from Spectrum Window Design in Denver. They use Rollease plastic chain mechanisms to glide up and down. I used the internet to figure out how the mechanisms worked. And found the instructions at Sun Control. The instructions seemed very straightforward, but using the upholstered valences made the task more complicated. 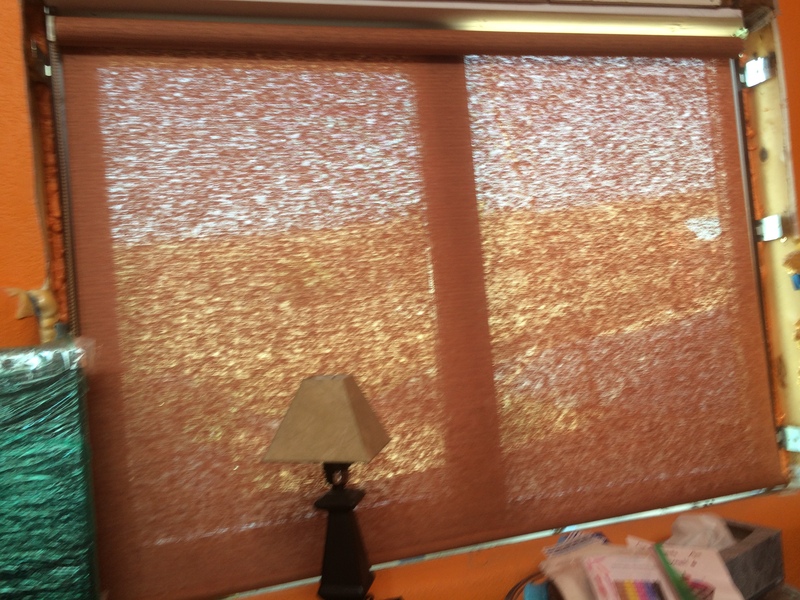 I finally just removed the fancy material and installed the blinds with the bare cloth covered boards they came with. 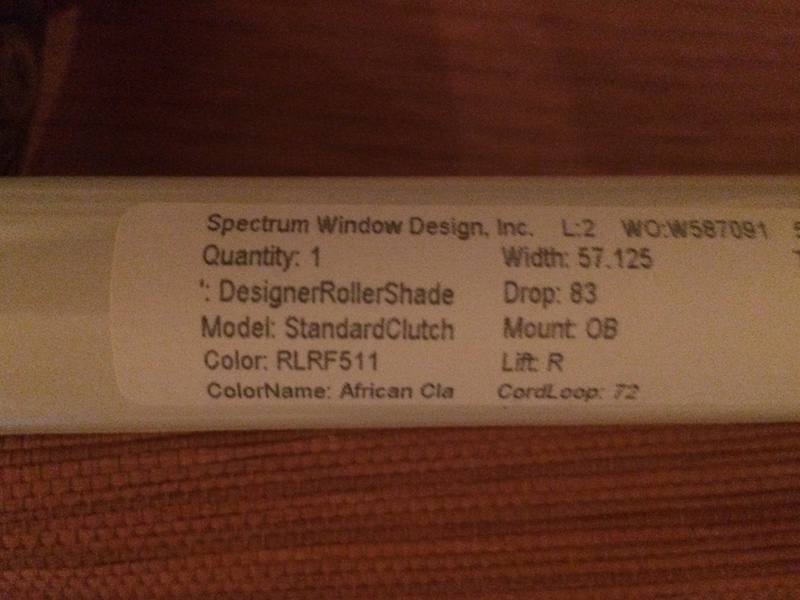 I didn’t know that one of the blinds was longer and therefore had a larger clutch. I installed the longer one in the middle window but with the small clutch bracket and that didn’t hold the shade correctly. 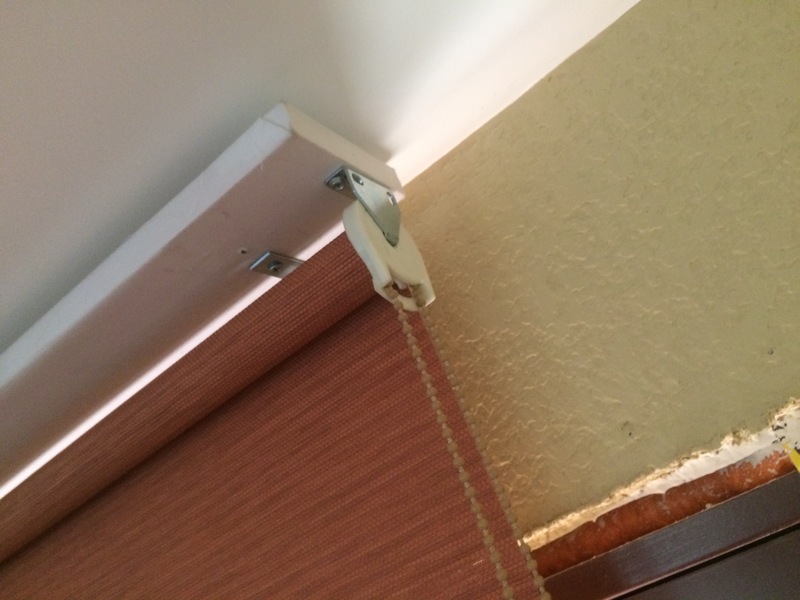 I figured that out but then I noticed the heavier blind was pulling out the header board so I installed screw anchors but just for that one. 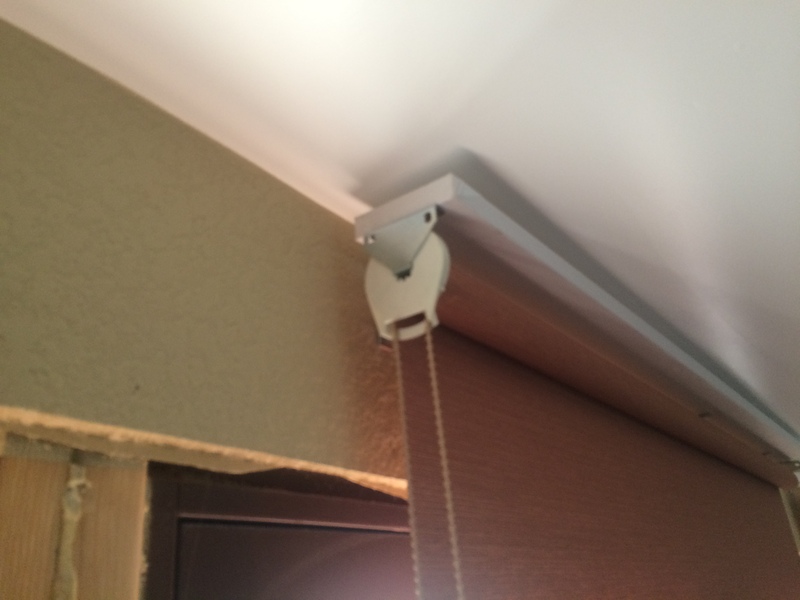 Not all of the sets of blinds fit the boards as set up. So I found myself measuring the distance and moving the brackets more than once. I also had a difficult time getting the plastic stops in the correct position. I would often place it on the wrong side so that once up the shades could not be unrolled. I did not realize until the very end of the job that the clutch could easily be slipped out of the tube and slipped back in the right position to maintain a fully rolled up shade. But eventually the shades were installed and they do a great job of keeping the sun from shining on my radiantly cooled floor. And the fourth shade fit perfectly with an inside mount in the extra bedroom north window. Shortly after returning from Germany we went out to see our son’s family and meet his new baby girl. I decided to order a Fisher and Paykel tall tub single drawer dishwasher to install in their apartment. This will be a great help to the new parents and also has a sterilization feature for items like baby bottles and toddler lunch kits. We decided against an actual portable because the kitchen is very small. The drawer units are also Energy Star rated and efficient. We knew how much space we had to work with in the cabinet. We tested the water flow from the faucet and it was over the dishwasher’s requirement. So we decided to hook it up like a portable because there was no under sink access to the hot water. Inside dimensions were wide enough but not quite deep enough. 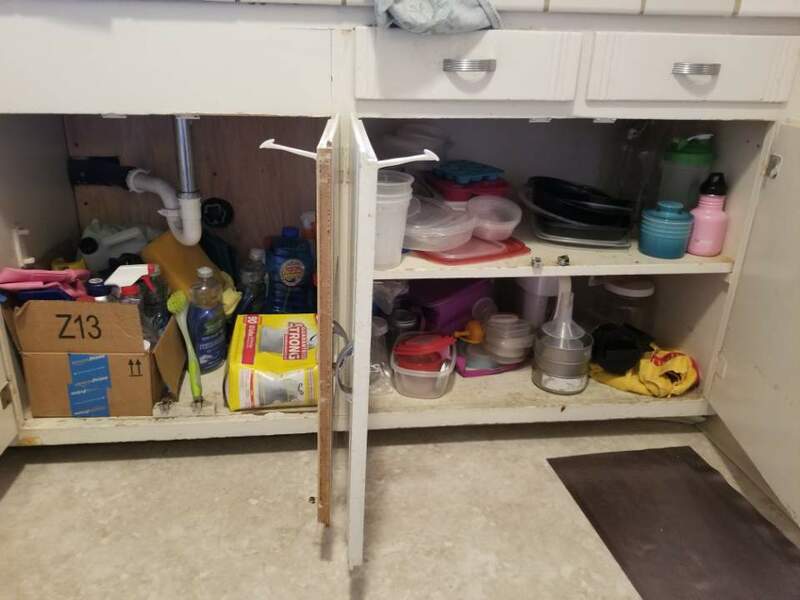 But it turned out the back of the sink cabinet had been removed and replaced with a piece of screwed in plywood and the back of the side cabinet also had a rear piece that came off easily. 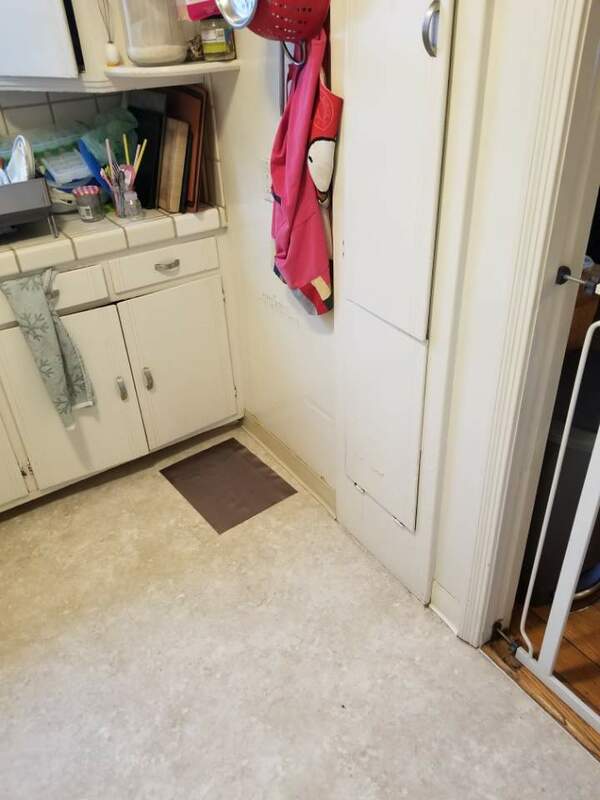 Behind the cabinets was a chase in front of the outside wall. Through this we ran the supply and drain pipes and the exhaust pipe. 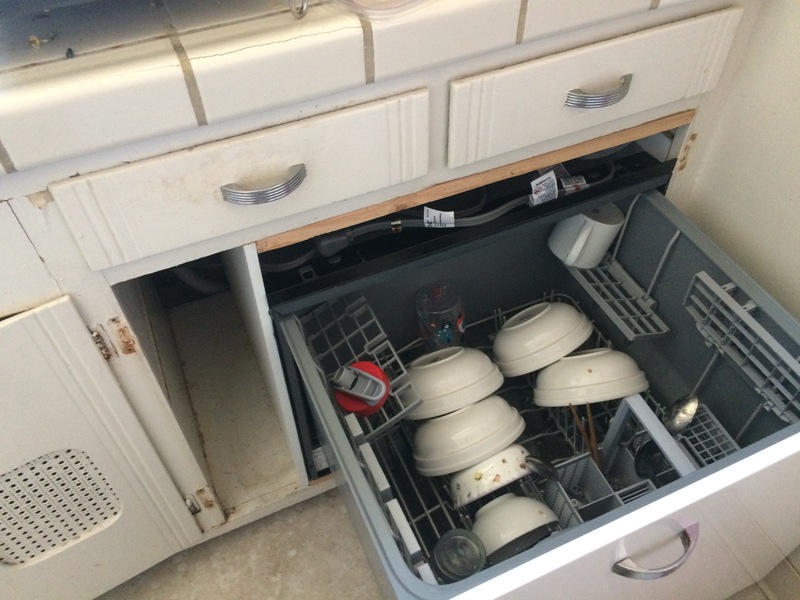 These drawer dishwashers have an exhaust vent to allow for excess moisture to escape. 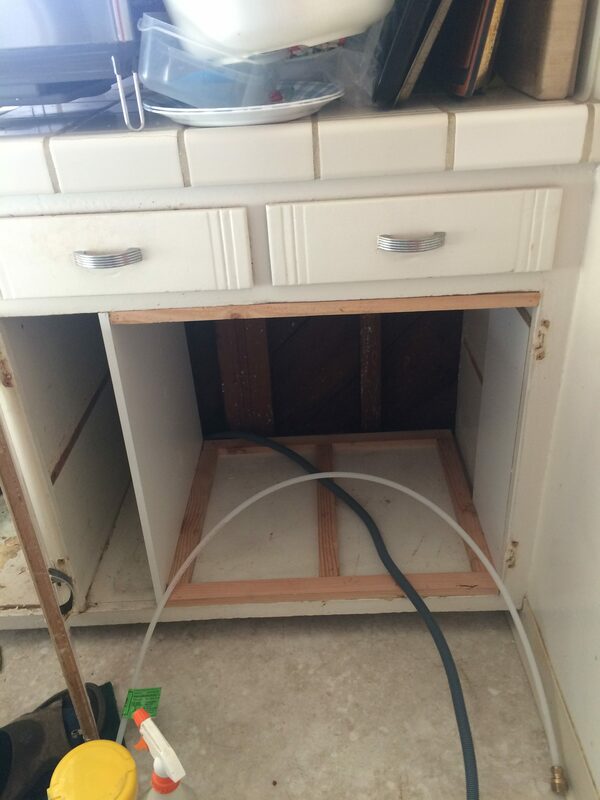 With the rear of the cabinet removed there was plenty of room to fit the depth of the dishwasher too. 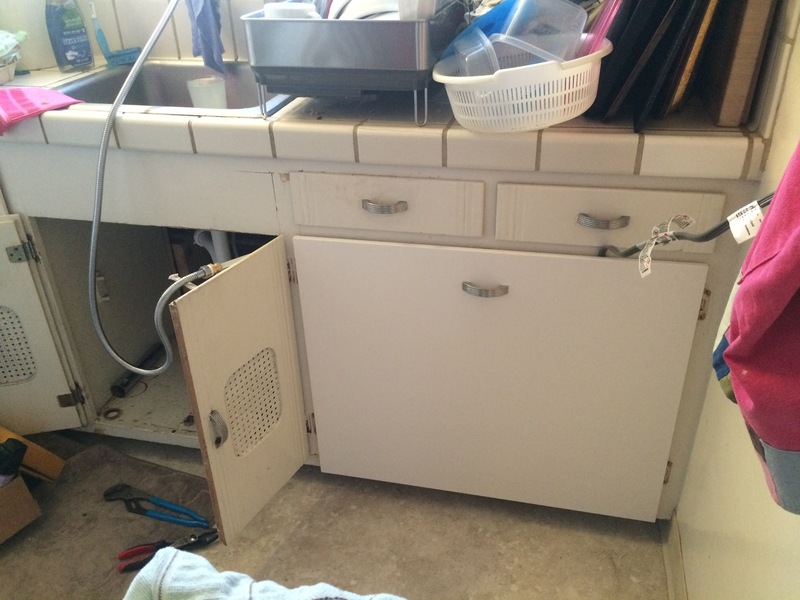 We intend for the dishwasher to be removed when they move so the frame inside does not alter the cabinet in any way. It is built from 1 x 2’s tacked to the cabinet bottom and under the drawers. We were fortunate to find just the laminated boards we needed for the side and front at the clearance room in the local Ikea. A side panel was cut and tacked to the frame that created the exact width called for in the installation guide. 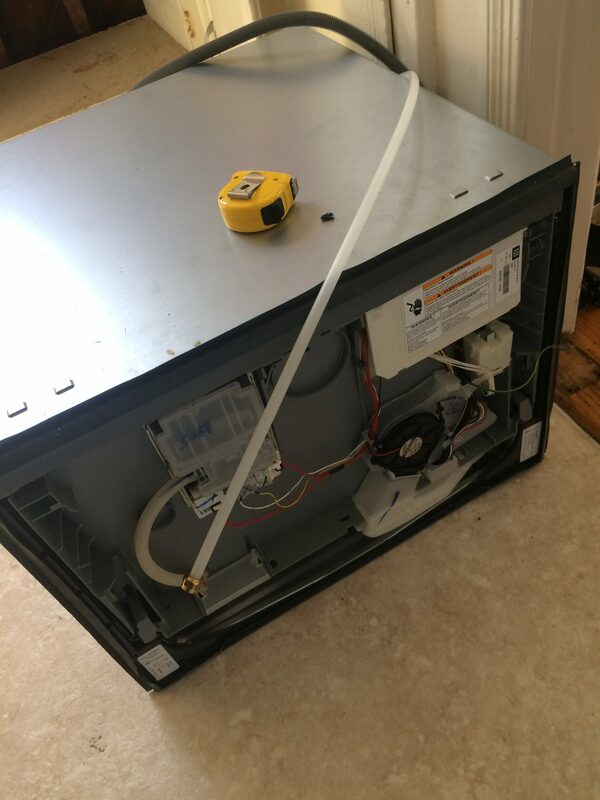 We removed the bracket to attach the panel to the front of the dishwasher so we wouldn’t damage it. Then we figured out the side brackets for the dishwasher. At first they were confusing as the markings were very faint and I got one in backwards that my son had the patience to extract to try again. But the dishwasher slid easily into the space after they were successfully attached. Next we had to figure out how to make the hook up easy for them to switch between dishwasher and kitchen sink. I thought a diverter would be ideal. But I could only find a shower diverter with a 1/2 inch shower connection. 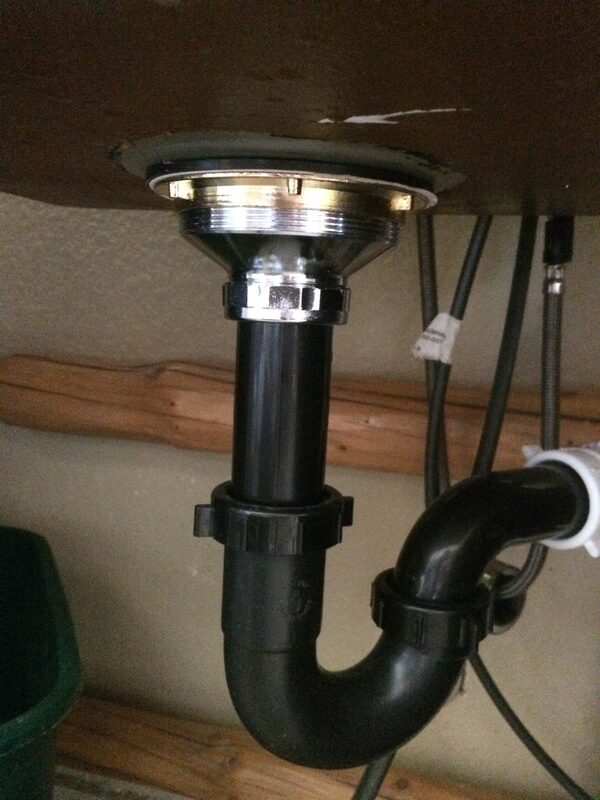 The dishwasher had a 3/8 inch compression fitting meant to go on a typical water valve. 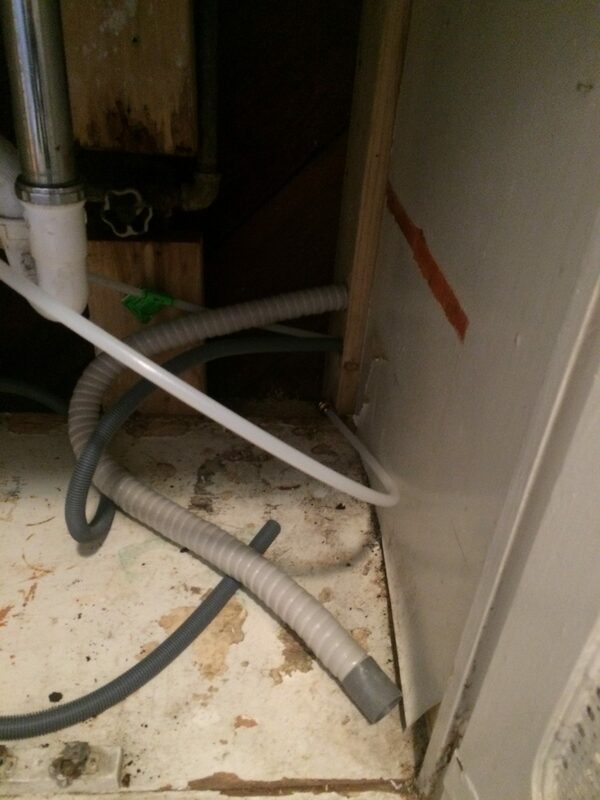 I had sent a dishwasher installation hose that wasn’t needed because unlike the installation instructions I downloaded for the model, this one had an attached pex supply hose. I had purchased a 3/8 inch compression to 1/2 inch NPT female fitting. I didn’t find 1/2″ quick connects at the time but I was looking for the wrong thing. Nevertheless the supplies I bought didn’t work. The shower threads are not typical NPT but they are straight threads instead, known as NPS. So my connector would not fit the diverter. I had ordered an adapter to fit his faucet but the one I bought was mislabeled and we had to go on a hardware search looking for the right sized adapter. 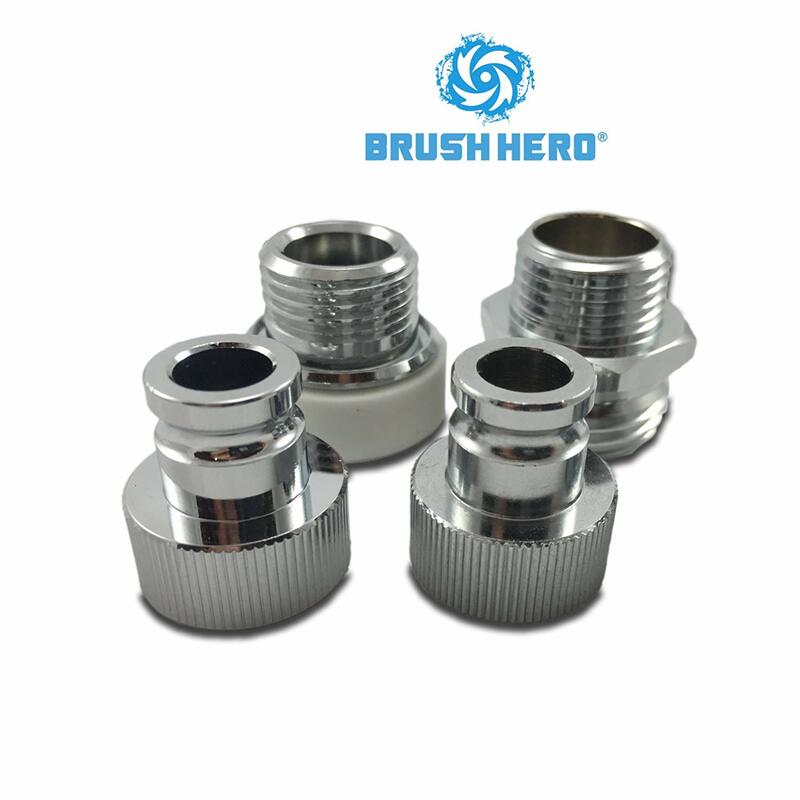 We thought about moving up to a 3/4″ fitting to use a regular hose quick connect but the adapter we ordered for that was also mislabeled and huge. Then we looked up shower quick connects and found them. We ordered a chrome set. 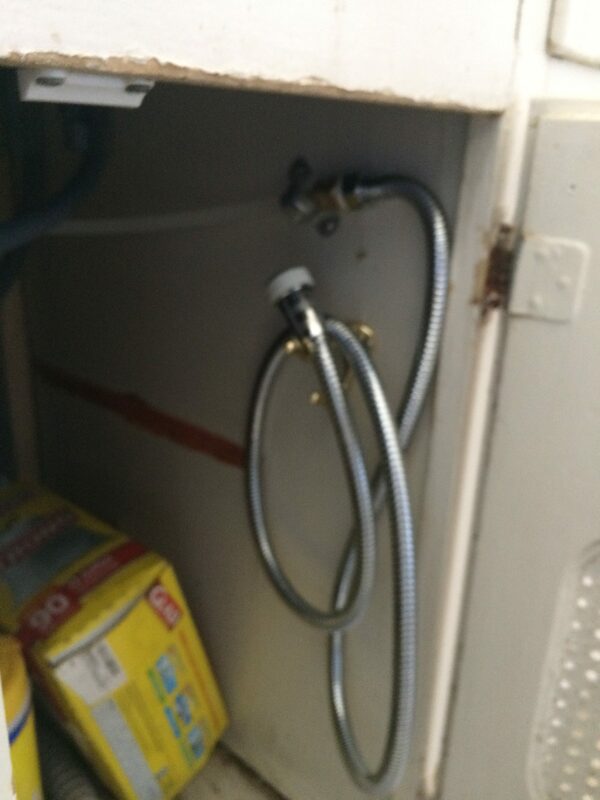 So using a shower hose and the original NPT connector we were able to put together the connection to the kitchen sink faucet. 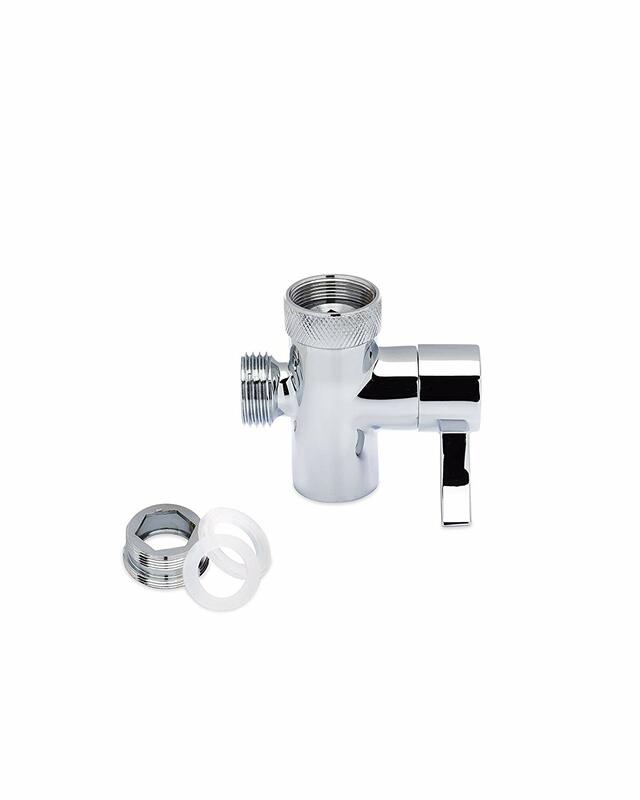 Diverter at faucet with quick connect. Then we hooked up the drain. We had to replace the chrome tailpiece with a shorter plastic one. 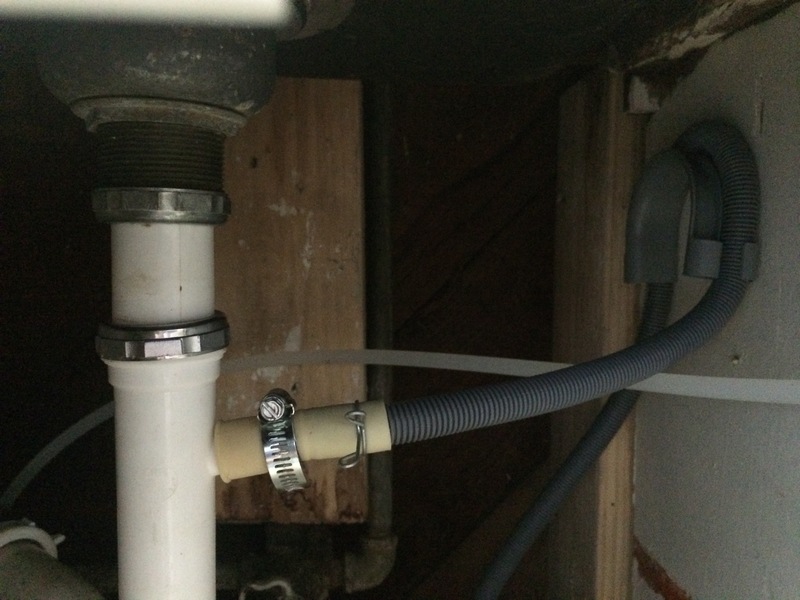 But attaching the drain pipe was easy with the included clamps. The brackets at the dishwasher sides were then screwed into the cabinet sides and my son did all the measurements to fit the perfect Ikea cabinet front onto the drawer bracket. I cleaned up one of the cabinet door handles and the installation was finished. We put in a hook to hold the shower hose under the sink. And after the rinse test was successful, we loaded the drawer for a first wash. They are using the side area to store the dishwasher detergent. I also ordered an electrical cord because I thought the dishwasher didn’t come with one but it did. Instead of replacing the cord, we used a heavy duty appliance extension cord. It extends from a small gap in the cabinet front to a nearby electrical outlet. They are very happy with the convenience of having a good dishwasher. It is so quiet it is difficult to know that it is running. Because it is fully integrated, it is started with a remote. But if you miss the six beeps that say the cycle is ended, you have to guess whether it is finished or not. But that does not seem to be a big impediment for the kids. Happy to have made the newly enlarged family’s life a bit easier. 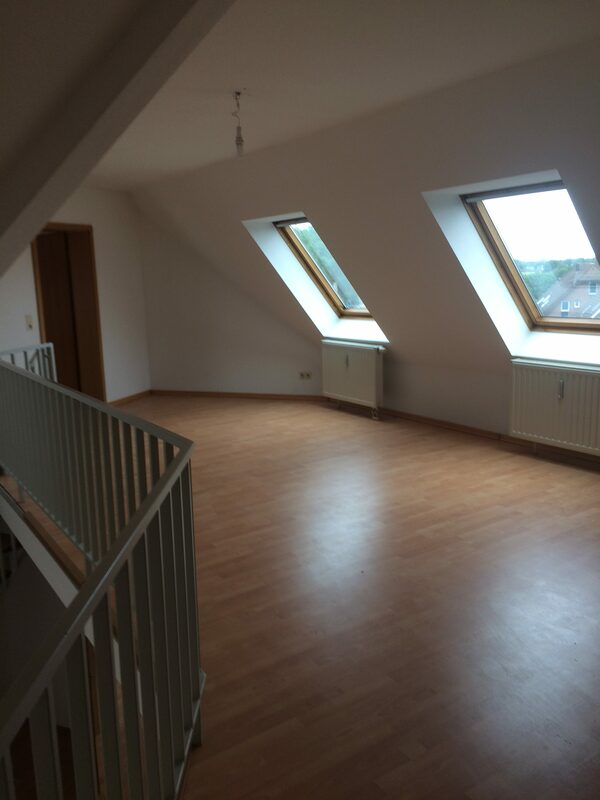 While visiting the family in Germany I helped put together furniture that they purchased second hand through the German eBay that functioned more like Craigslist here. They bought loft beds for the kids, and Ikea like slat beds called “lattenrost”. 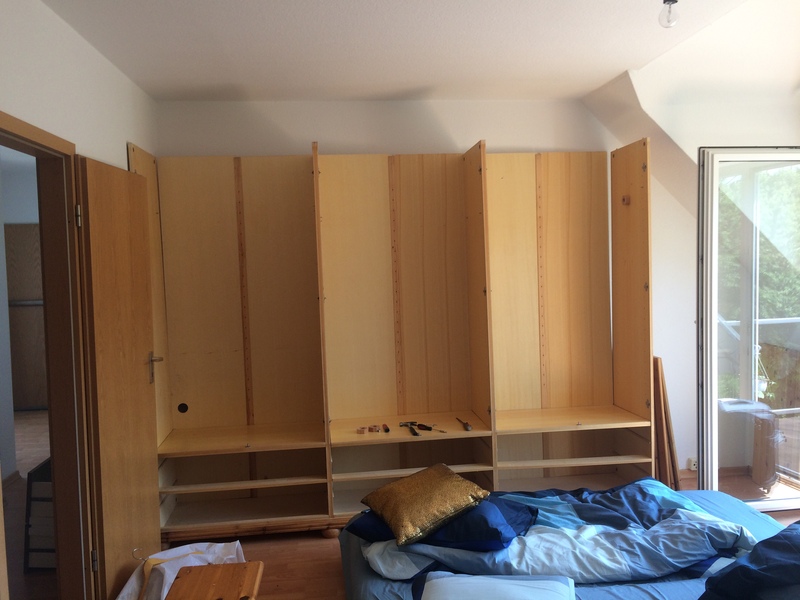 Since German apartment bedrooms typically have no clothes closets, they bought large wardrobes. This one has several shelves, two hanging areas and six large drawers below. It is pine and quite nice. And it fit the space exactly. They purchased oak dining room furniture with a breakfront, and a lovely handmade wood (cherry I think) buffet that was actually free! 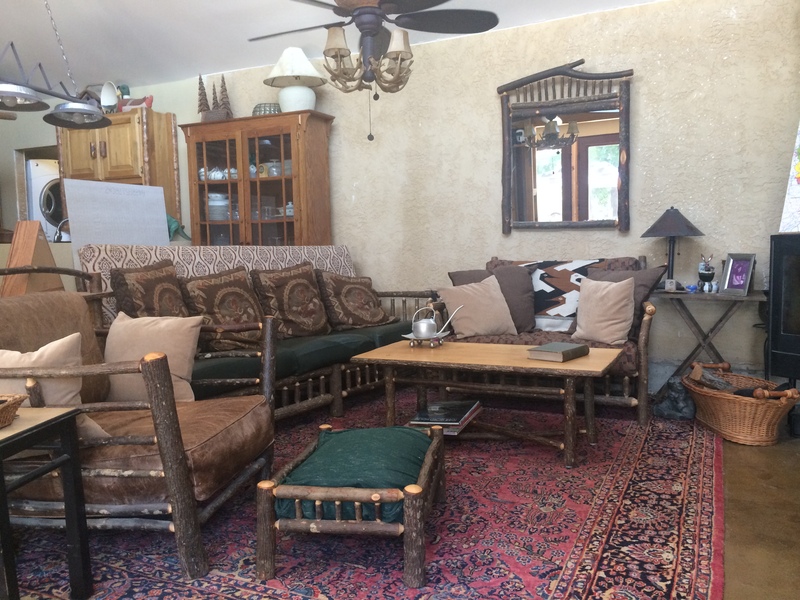 Also a couch and chairs and coffee tables for the living room area. 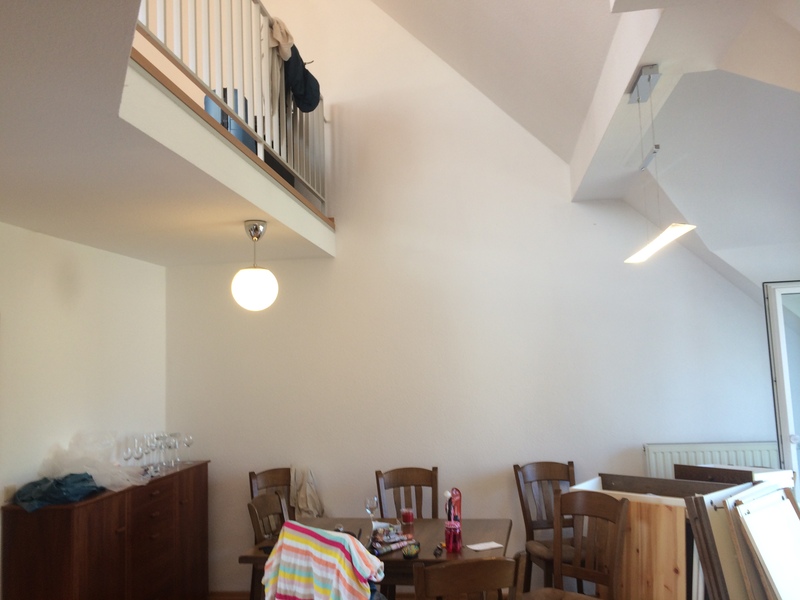 They rented a large van and some work colleagues helped move the furniture up those three long flights of stairs! Ikea is popular there and the closest store is about 40 minutes away in the Netherlands. We drove over and it was fun to see a foreign Ikea-with a mirror image layout of the one in Tempe, AZ that I used to live near. We bought linens and a couple mattresses and a light fixture. I installed a few light fixtures as most of the rooms had only bare bulbs hanging from cords. We didn’t really do much touring. But we had some lovely treats. My Son-in-law loves early morning walks to the bakery to buy German rolls and pastries. We had fresh rolls every morning! 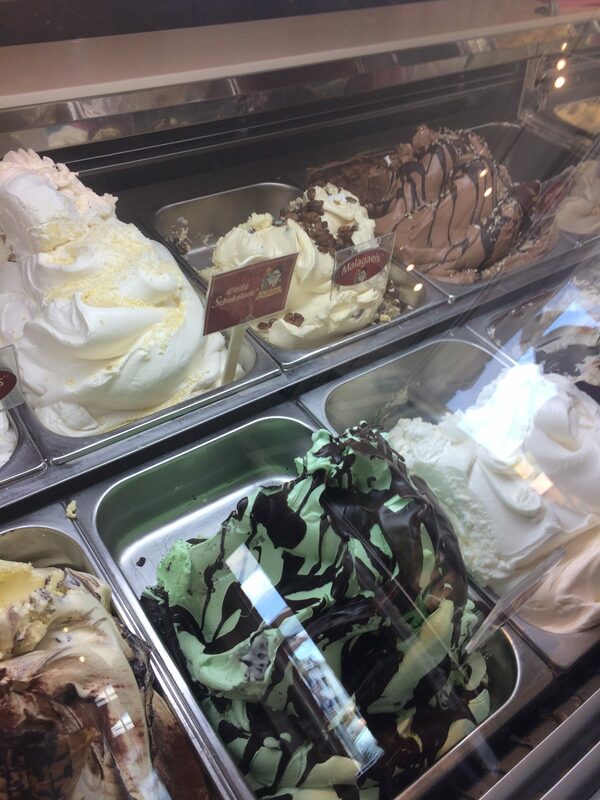 The family is also very fond of the ice cream shops. We stopped by more than once for this delicacy. I guess it helps the businesses that apartment refrigerators don’t always have freezers. 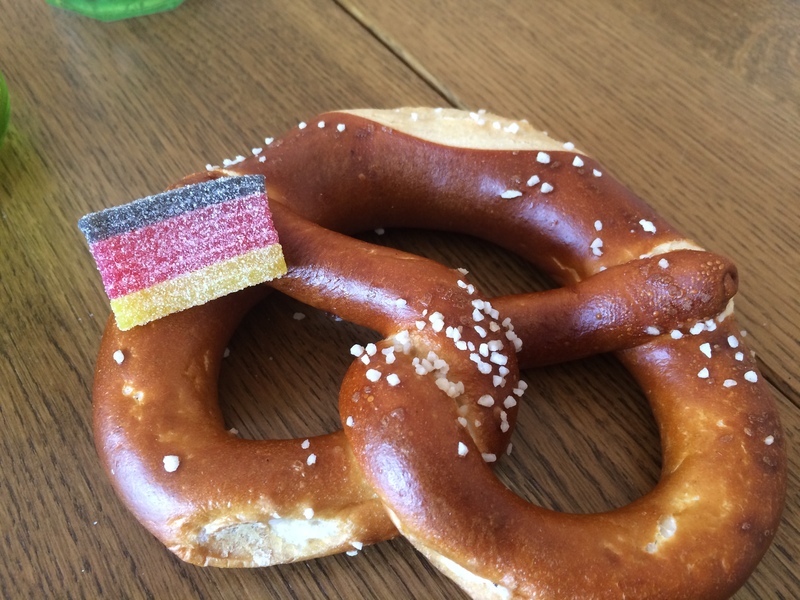 The grocery store sold these yummy German pretzels and German flag sour fruit gummies that my granddaughter loves. 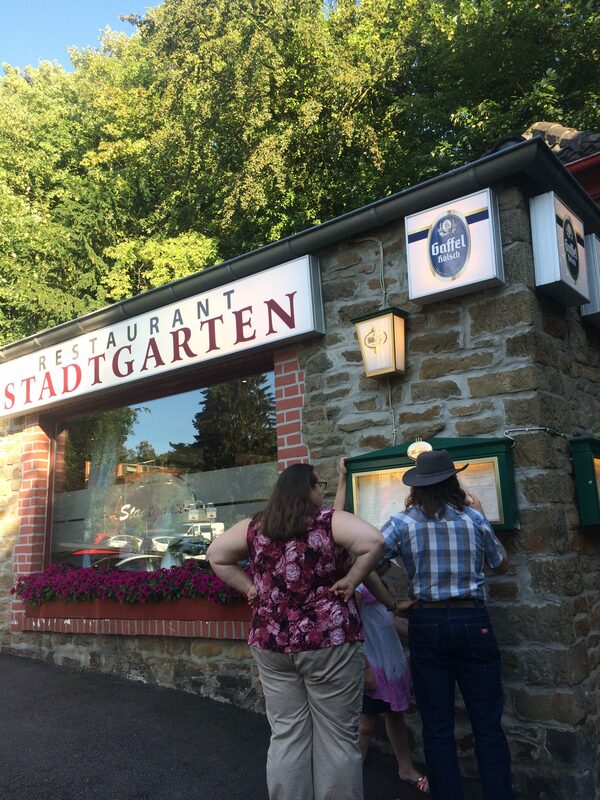 We had a couple meals at traditional German restaurants. I had snitzel a couple different ways. For a slight variation, we stopped at a Bavarian beer garden and restaurant that had a little playground for kids and a bicycle tire vending machine! In downtown Wurselen we went out to a Turkish restaurant that had an interesting menu. They serve hamburgers and fries but ketchup costs extra in Germany! Right outside the restaurant was the World Cup banner and we were treated to a long line of honking cars the night Germany won a game. One rather exciting development was an emergency hospitalization for another bowel attack! 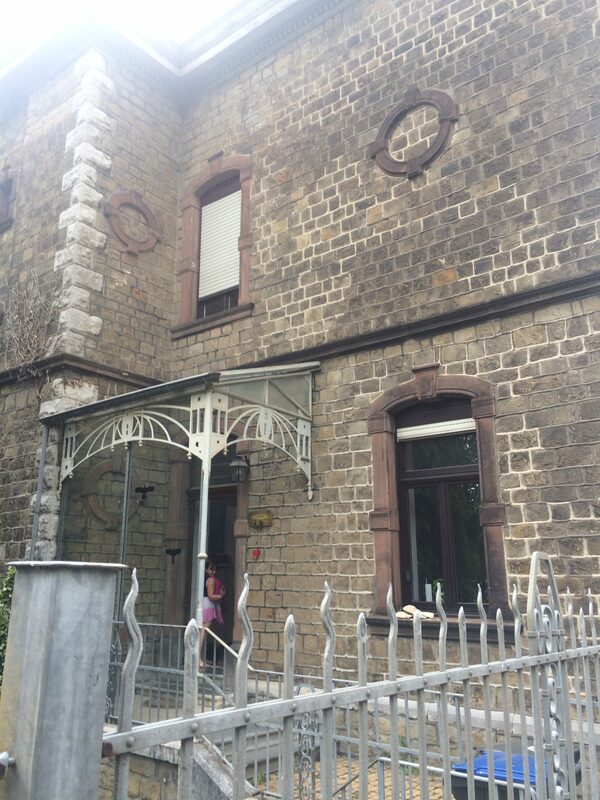 So I got to experience a German hospital in Stolberg. It was very pleasant and the staff were all wonderful and were kind about the language barrier, sending me staff who could speak English. My son in law is also fluent and got me admitted and paid the fees upfront for me so that my insurance claim can pay later. One difference was that the patients wore their own clothes including nightshirts and day clothes and instead of going to the room on a gurney, I was placed on a bed that was my hospital bed. When I left, they took the bed out of the room and probably sanitized it. There were rows of beds in a storage area each covered in plastic waiting for patients. There were three beds at one time in my room and then two ladies went home and another came. The view from my window, and I was at the window was beautiful. 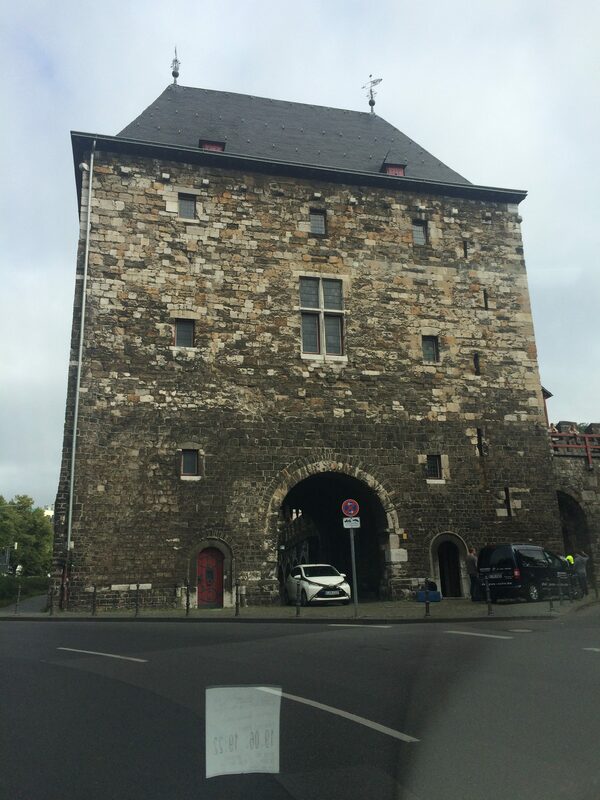 I was looking at the Stolberg Castle! 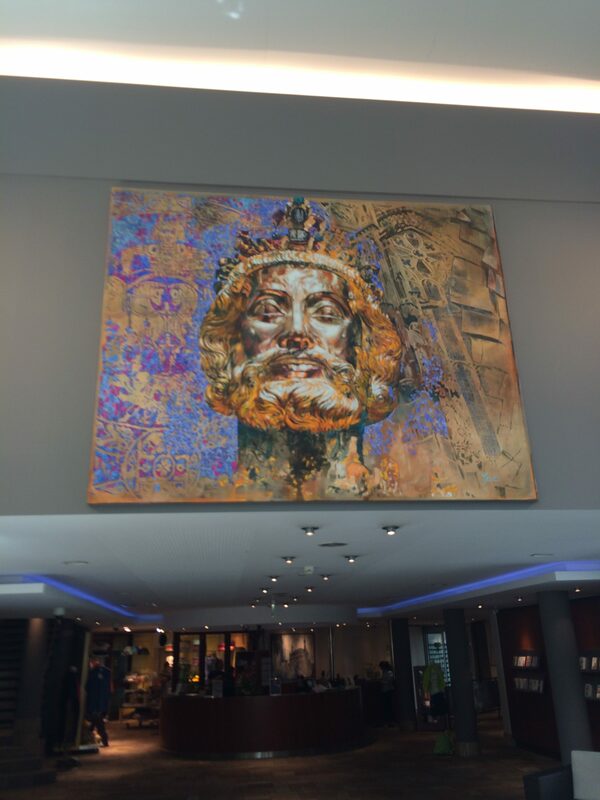 Aachen was once the capital of the Roman Empire and the seat of government for Charlemagne. We took time out to go to the Aachen Thermal Baths and enjoy some soaking and horsing around in the pools. The kids scout troop meets at the old fort and city wall. There are not separate boy and girl scouts. But they are divided by age. The kids also were admitted to their school as guests for a couple of weeks before the session ended. They got to experience the German school that they will be enrolled in next term. 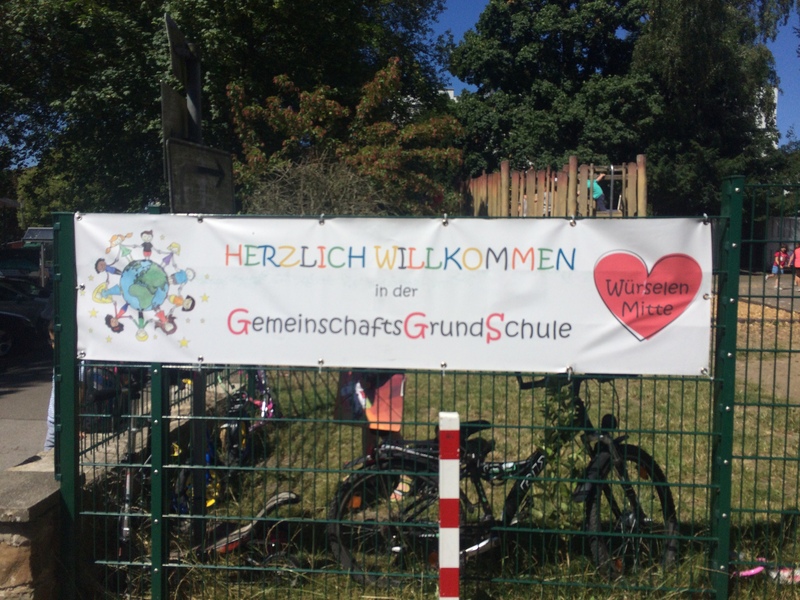 They enjoyed going to class and meeting German kids and teachers. After a few extra days to recover from hospitalization, I was winging my way home and stayed awake for 23 full hours of travel. It was a movie marathon trip because I was able to watch several movies on the airplanes. But like many travelers I came home and got sick. I went to urgent care at home and got treated for strep so feeling good a day or so after that. Thank goodness for antibiotics. 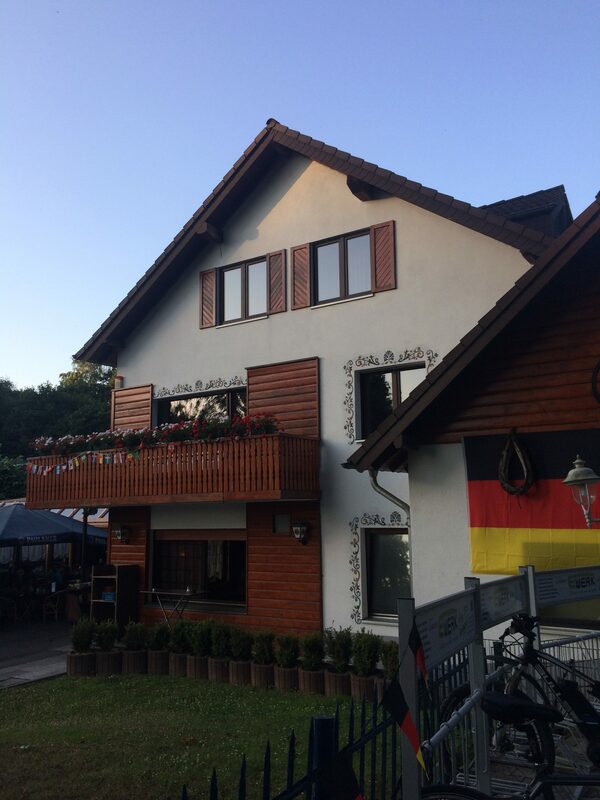 In a strange turn of events, my daughter and her family, including my two wonderful grandchildren, have moved to Germany for a few years for her husband’s job! We moved close to them when we retired and although we like it here we surely will miss them terribly. They had to empty their house and store what they could. Their house is rented and they will hopefully be returning when this adventure is over. In the meantime as soon as I learned they were leaving I made plans to visit and hopefully help them settle in. The job is in Aachen, Germany just over the border from Belgium and the Netherlands. 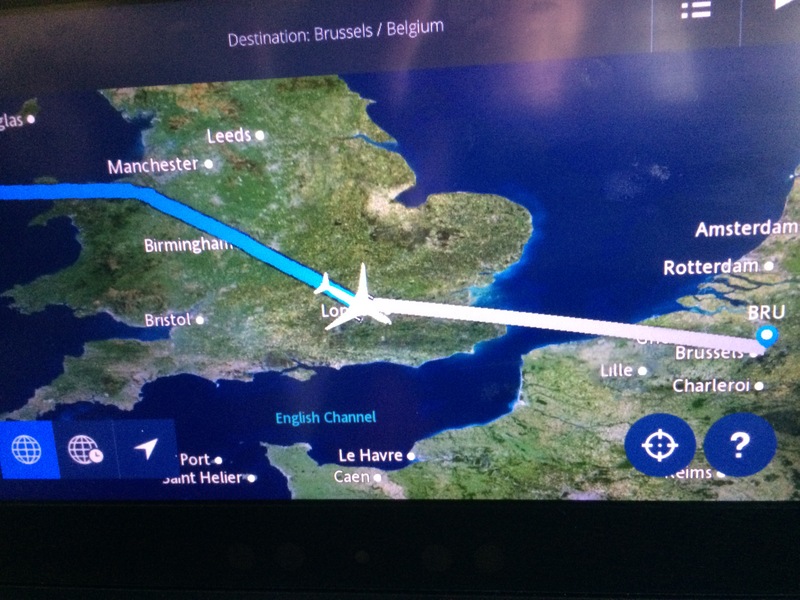 So it was most convenient to fly into Brussels for my visit. I flew to Atlanta in about 3 hours and then took an 8 hour flight to Brussels. 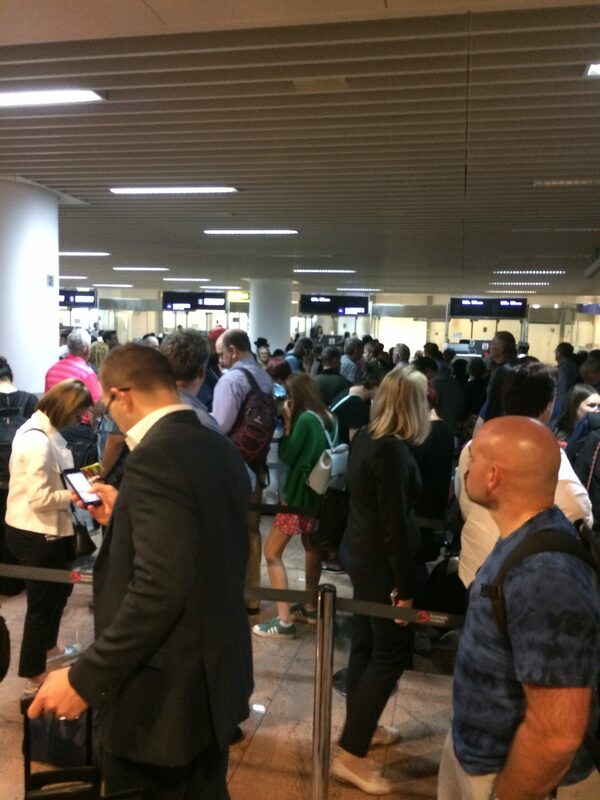 After landing and deplaning, we had a long line to go through immigration to get passports stamped. The family was staying in a beautiful old home in Stolberg that had been renovated but still had obvious signs of retrofit including a very old plumbing installation. It also had many beautiful details. But buying an 1980’s house and updating and buying a 1800’s house and updating are two very different challenges. One of the most interesting features was what they called a shelf toilet. No longer much in use, the Germans and other Europeans had a toilet that held water in the front instead of the back and only enough to cover a small hole. Waste is deposited on a shelf and flushed clear (mostly) by a rush of water at the flush. All toilets seemed to be dual flush and this model seemed to use little water. But the necessity of using a brush to clean up required more flushes. Stolberg was about 20 minutes from Aachen and the family wanted to be closer to the city and jobs, so their apartment is in Wurselen. 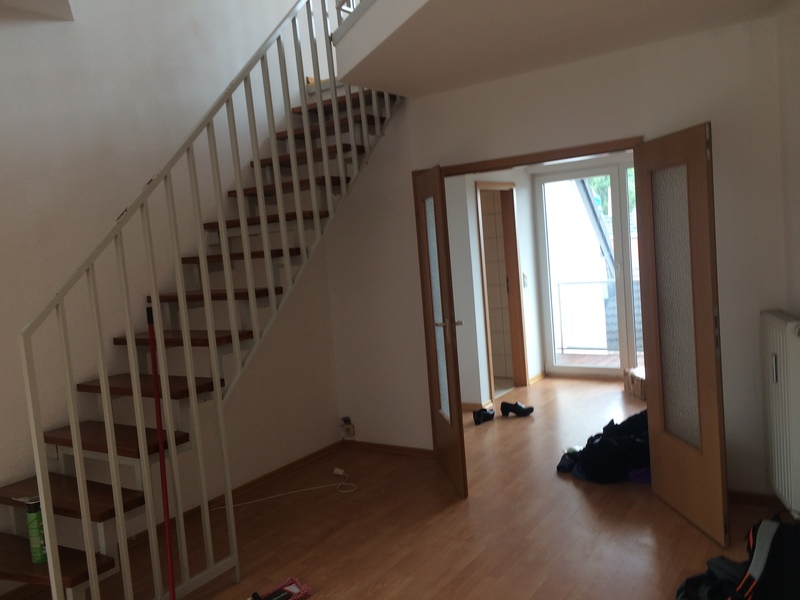 It is very spacious for a European apartment and has two floors but the entry is on the third floor of the building. The hallway stairs are granite and the railing wrought iron. Each flight of stairs curves in the middle. It also has a parking space in an underground garage, a storage room and a designated washing machine spot in a shared laundry room. It has a wing with two bedrooms and a full bath, an entry with a half bath, a large room that the family will use for dining as it is off a small kitchen. Many German apartments don’t have kitchen cabinets and appliances, but this one did. Unfortunately the refrigerator is quite small and does not have a freezer compartment. But they will probably add a bit larger refrigerator to supplement the existing one. There is a room off the dining room that will be used as a kid bedroom. Upstairs there is a large loft area that they plan to use for a living room and a huge walk in storage closet at one end. It has hot water heat that appears to be controlled at the radiators. There is also a very large bedroom upstairs that they will use for office and guest bedroom space. There are three decks, two smaller off the kitchen and entry and one larger with doors from the main room and the master bedroom. 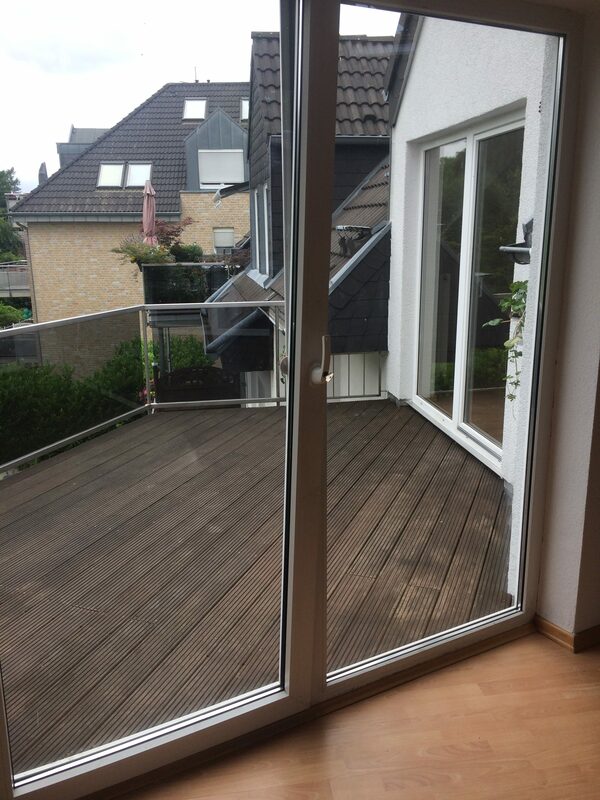 The temperatures were in the 90’s while I was visiting which is high for Germany but with the windows open the apartment benefitted from a lovely breeze throughout. 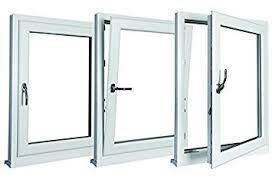 Like almost all German windows and doors they were the tilt and turn variety with no screens. But they allowed for the great ventilation. The apartment is lovely and light-filled and spacious and seems like a happy place. It is past time to have moved everything that is destined for the house into the house. These mirrors needed to come in and claim their space. 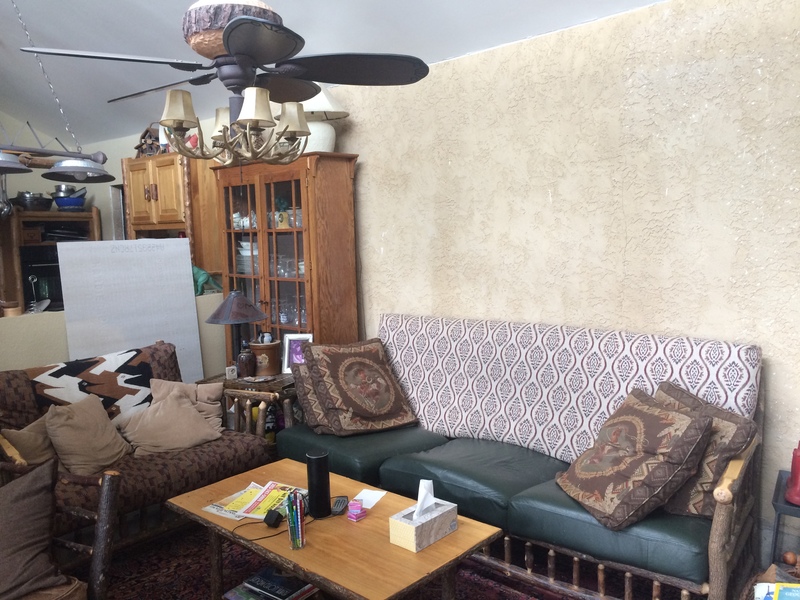 I had the big couch against the long wall in the living room but the size the hickory mirror seemed off balance. So the couch and loveseat traded places and the mirror centers over the loveseat perfectly. I used the Ramjet nail sink to attach the mirror to the concrete wall. The first short nail rammed all the way into the wall and I couldn’t extract it. I just used a longer nail in about the same spot. The second mirror was my grandmother’s. She had it in her hallway and I’m pretty sure it came from her old house. Maybe even her parent’s house. It is ornate and I had it in my more ornate living room in Arizona. Here in Colorado it seemed perfect for over the Victorian tub. 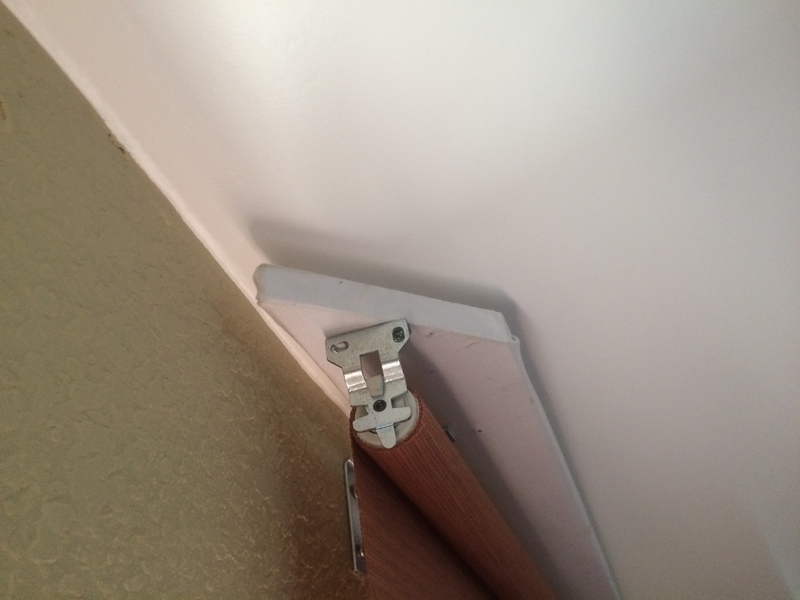 This one is hung on two screws driven into plastic drywall sleeves. 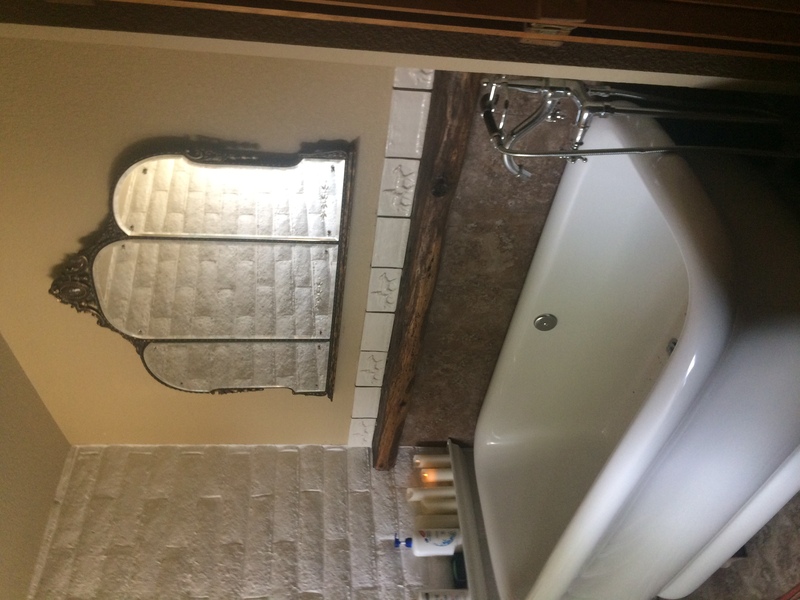 Grandmother’s mirror over Victorian style tub.